Date: October 1906. Place: In front of the boarding house and saloon owned by Raffaele Genetti in Weston, PA. The photograph commemorates the double wedding of brother and sister, Richard and Virginia Fedrizzi (5 + 6, 8 + 9). According to the story attached to this photo, Raffaele’s wife, Lucia, was upstairs giving birth to her youngest son Albert while the festivities took place downstairs. Photograph courtesy of Ralph and Larry Genetti, (sons of Albert Genetti and grandsons of Raffaele). 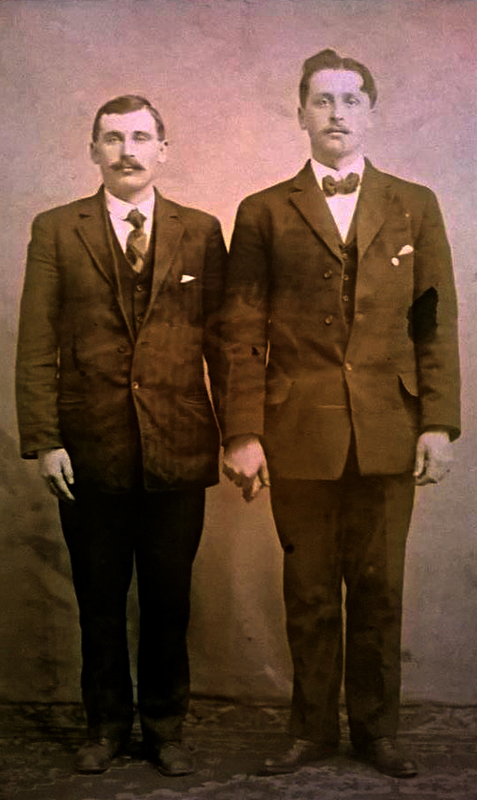 Damiano Genetti and Oliva Zambotti on their wedding day, September 11, 1886. They were married in Scranton, Pennsylvania by Bishop William O’Hara. 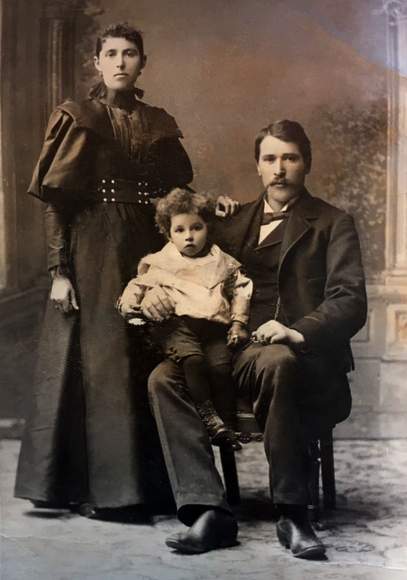 In 1887, their first child, Leone, was born. 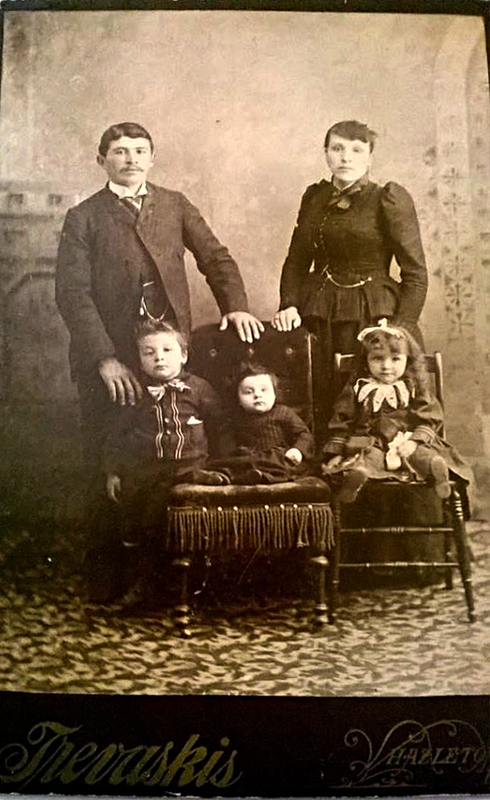 Portrait of Damiano and Oliva Genetti with family, photographed in Castelfondo, Austria (now Italy), about 1898 or 1899. Damiao is seated on the left, Oliva is in the center, Leone (Leo) is the tallest son in the back touching his father’s shoulder, between his parents stands Augusto (Gus), seated between Damiano and Oliva is Esther, to the right of Oliva the taller girl is Addolorata (Dora), next to her is Ottilia (Tilly), Albino (Albert) is standing behind his sisters and Erminia (Erma) is the little girl holding Oliva’s hand. Costante (Stanley) and Angela (Ann) have not been born yet. Photograph is courtesy of Jean Branz Daly. Jean’s mother was Erminia Genetti Branz, one of Damiano’s five daughters. This beautiful studio portrait was taken in Pennsylvania about 1909. It is a photograph of Damiano and Oliva Genetti’s five daughters. 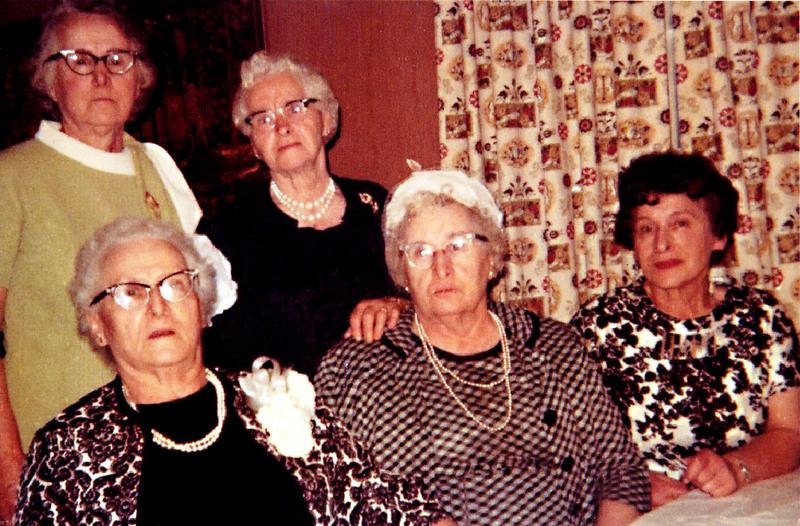 From left to right: Ottilia (Tillie), Esther, Angela (Ann), Addolorata (Dora), Erminia (Erma). Photograph is courtesy of Jean Branz Daly. Jean’s mother was Erminia Genetti Branz. 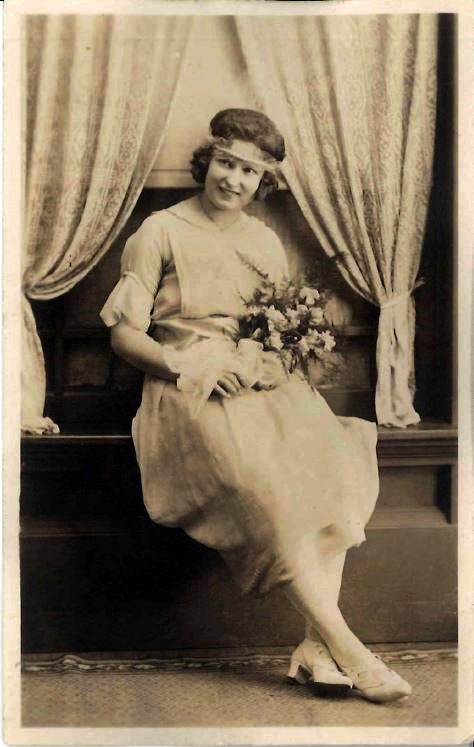 Addolorata Erminia “Dora” Genetti Bott (1889-1971), probably photographed around the time of her wedding to Verecondo Bott (1884-1955) – marriage date: February 21, 1911. 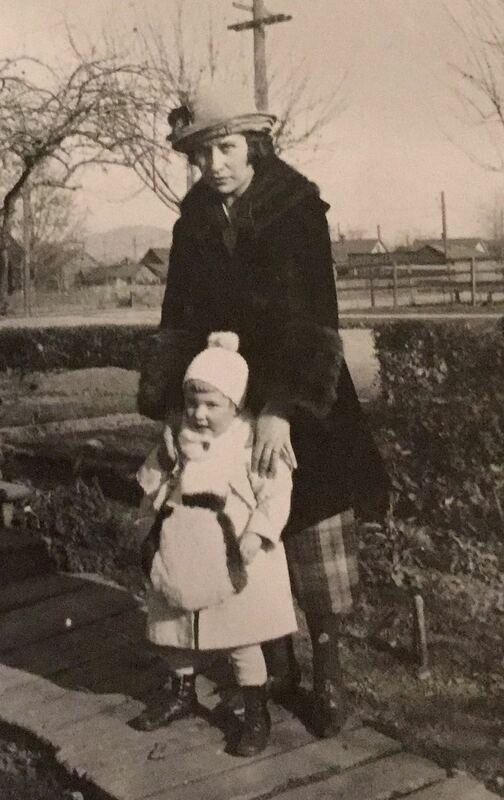 Photograph courtesy of Patti Redden, granddaughter of Dora Genetti Bott. Studio portrait of Cosma Damiano Genetti, most likely photographed in the early 1920’s. Born in 1857 in Castelfondo, Austria, Damiano lived a long and varied life. Throughout the years he traveled extensively back forth between Pennsylvania and Castelfondo, sometimes bringing different relatives to America. He served in the Austrian Army and was also the mayor of Castelfondo. Damiano was also known as a healer, being skilled in the use of herbs and other natural treatments. He was known as a benevolent man who never took payment for his healing services. Damiano died in Castelfondo at the age of 87 in 1944. Oliva Zambotti Genetti was the wife of Damiano Genetti. She was born in Castelfondo, Austria (now Italy) in 1861. 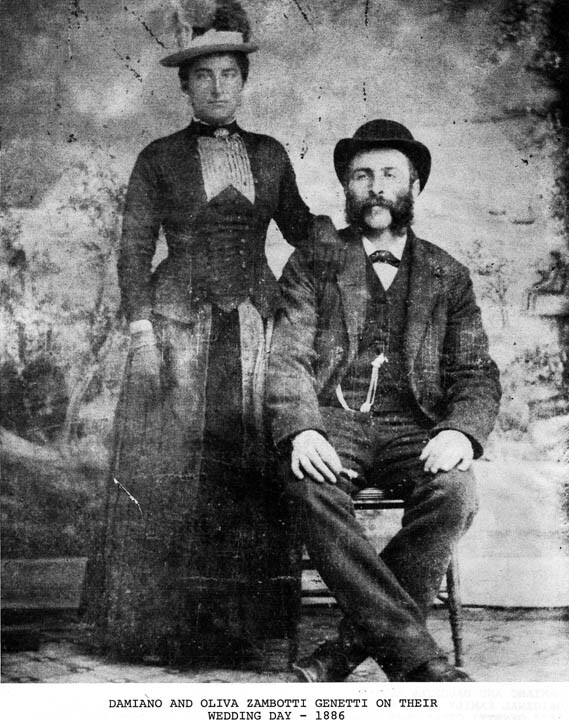 Oliva came to America in 1886 to marry Damiano. Soon after the birth of their first child in 1887, they returned to Castelfondo. Between 1887 and 1903, Oliva gave birth to thirteen children. Nine of their children survived to adulthood. In 1906 Oliva once again emigrated to the United States to join Damiano. He had traveled to Pennsylvania a few years earlier with four of their children to establish a business and a household. 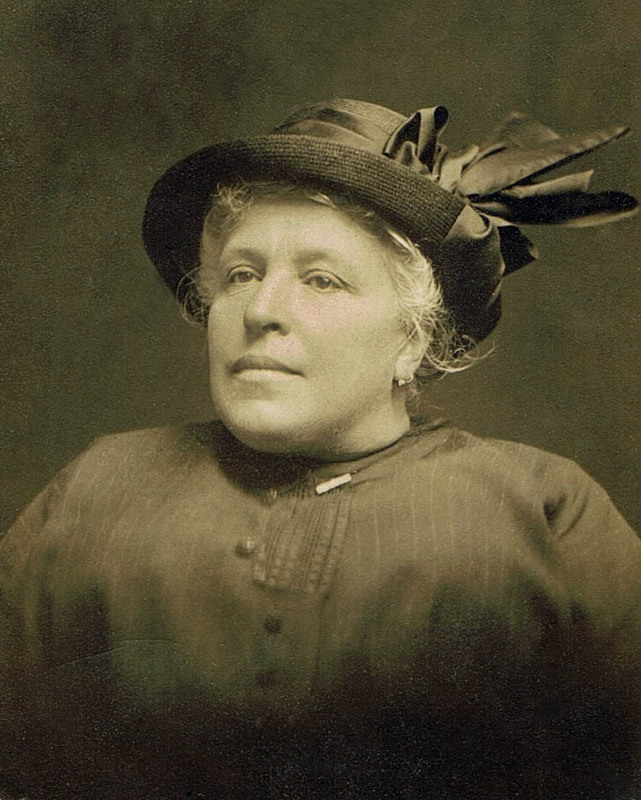 On December 3, 1906 Oliva arrived at Ellis Island with their remaining five children. She became a well-respected member of the Hazleton community, passing away in 1938. 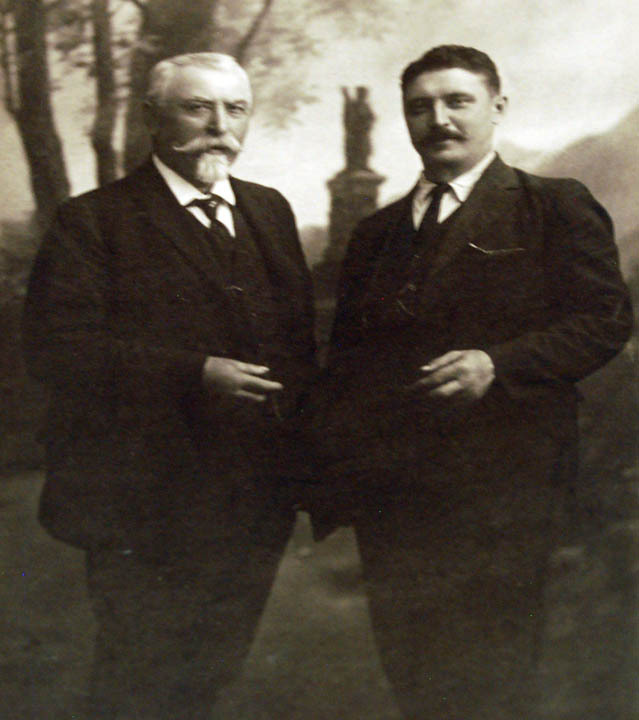 Pietro (Peter) Zambotti (1881-1966) and Leon Genetti (1887-1962), photographed in Hazleton, Pennsylvania, 1908. Peter was the son of Simone Zambotti and Catterina Dallachiesa, both of Castelfondo. Leon was the oldest child of Damiano Genetti and Oliva Zambotti. 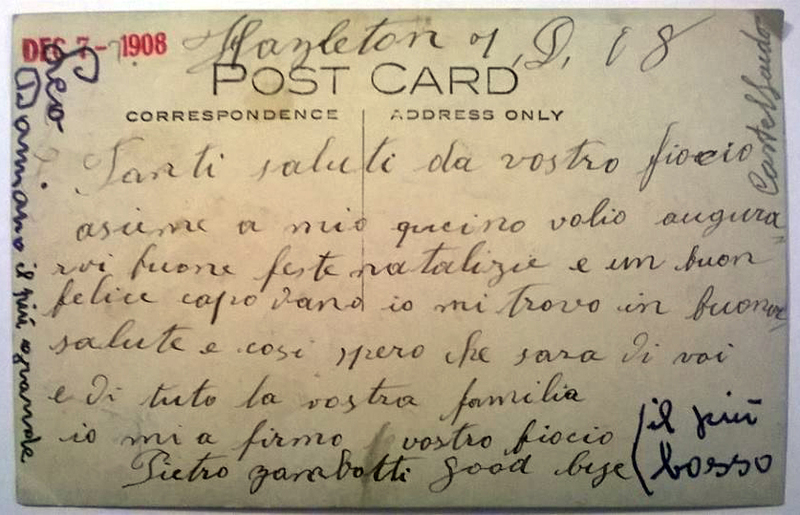 This is a picture postcard sent from Pennsylvania back to relatives in Castelfondo. Photograph courtesy of Giovanni Marchetti. The backside of the postcard pictured above. Translation: “Many greetings from your godson; together with my cousin I want to wish you merry Christmas and a happy new year. I am well and so I hope are you and all of your family. Your godson Pietro Zambotti.” Someone else wrote in the margins for identification: “the shorter” and on the left: Leo Damiano (the taller). Brothers Damiano and Raffaele Genetti. Studio portrait probably photographed around 1922. Damiano would have been about 65 years old at the time. His younger brother Raffaele was about 55 years old. Photography courtesy of Helene Smith Prehatny, granddaughter of Raffaele and Lucia. 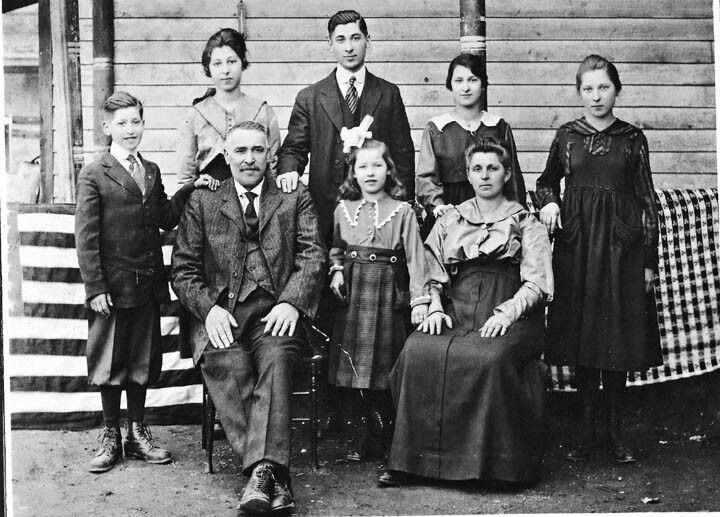 Raffaele and Lucia Genetti with their family, about 1916, probably photographed in Weston, PA. Front: Raffaele, Anna, Lucia. Standing: Albert, Mary, Silvester, Leona, Elizabeth. Photograph courtesy of Ralph and Larry Genetti. Photograph courtesy of Helene Smith Prehatny, granddaughter of Raffaele and Lucia Genetti. 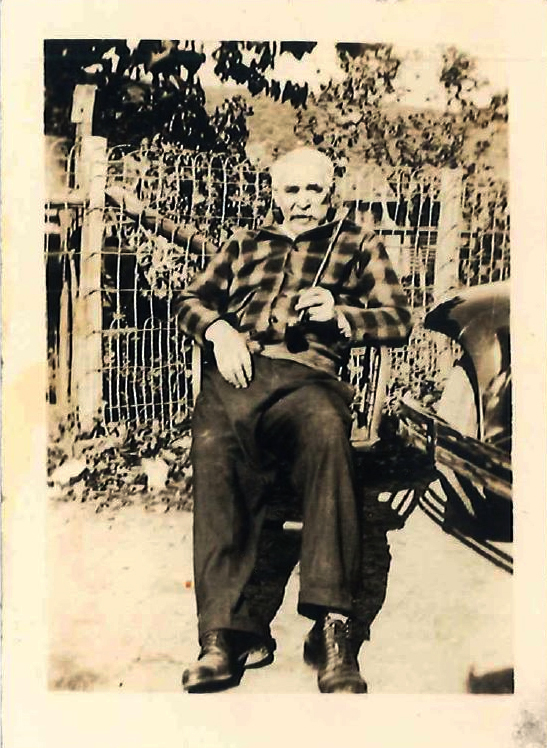 Raffaele Genetti (1867 – 1949), probably photographed mid-1940’s in Weston, Pennsylvania. Photograph courtesy of Helene Smith Prehatny, granddaughter of Raffaele Genetti. 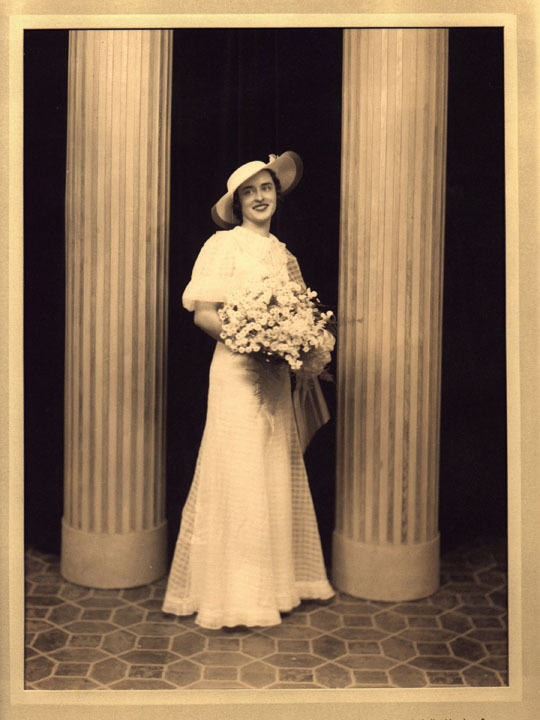 Elizabeth Genetti Smith (1904-1964), daughter of Raffaele and Lucia Genetti – portrait as a bridesmaid, probably photographed in the 1920’s. Photograph courtesy of Helene Smith Prehatny, daughter of Elizabeth Genetti Smith. 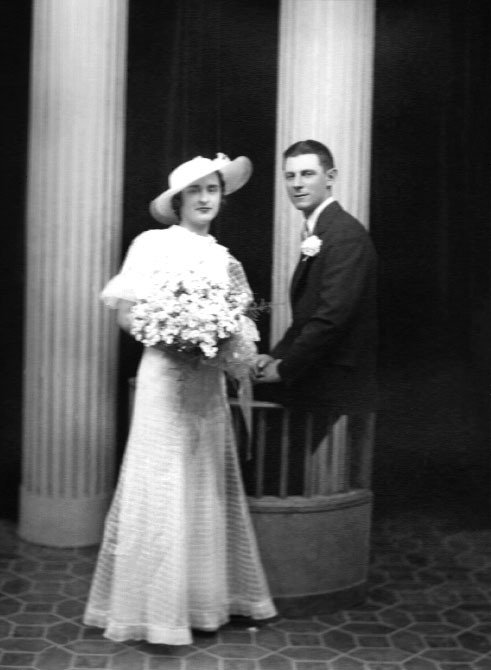 Paul Smith (1894 – 1957) and Elizabeth Genetti (1904 – 1964) on their wedding day, October 6, 1928. 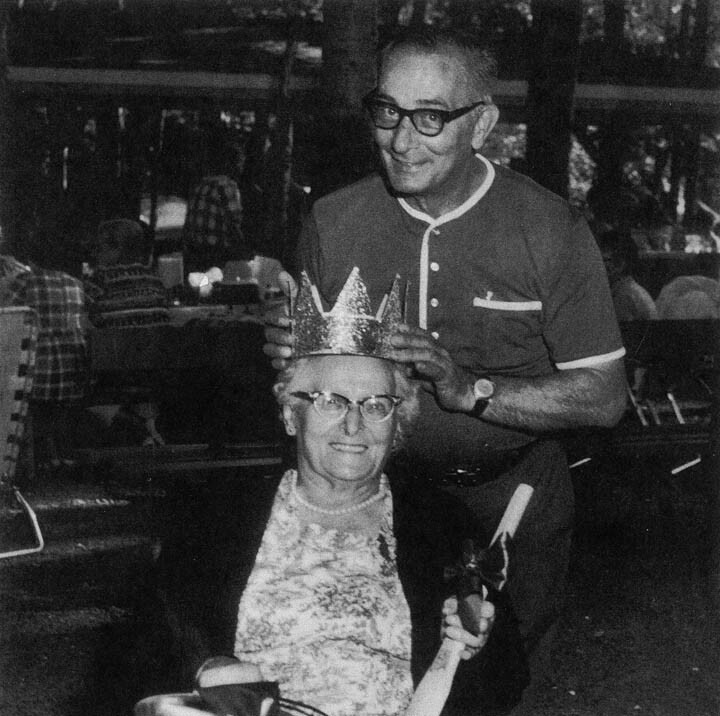 In attendance are Elizabeth’s sister, Leona Genetti Hayden (1903 – 1979) and Elizabeth’s brother, Albert Genetti (1906 – 1990). Probably photographed in Hazleton, Pennsylvania. 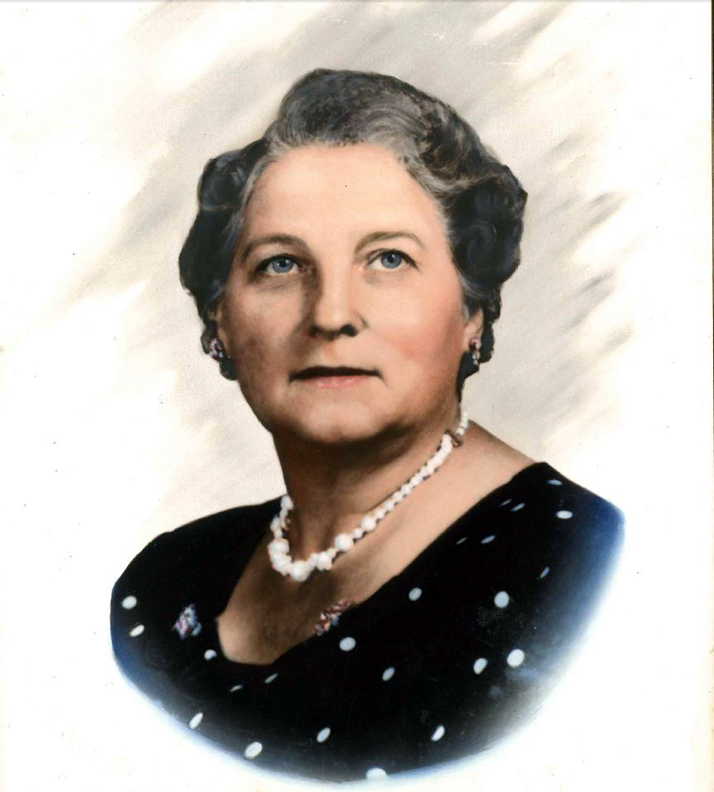 Portrait of Elizabeth Genetti Smith (1904-1964). Probably photographed late 1950’s or early 1960’s. Family portrait of Albert Genetti, son of Raffaele and Lucia (1906 – 1990) and Vivian Kummerer (1911 – 1990), with sons Lawrence (being held) and Ralph (standing). Photographed about 1947. 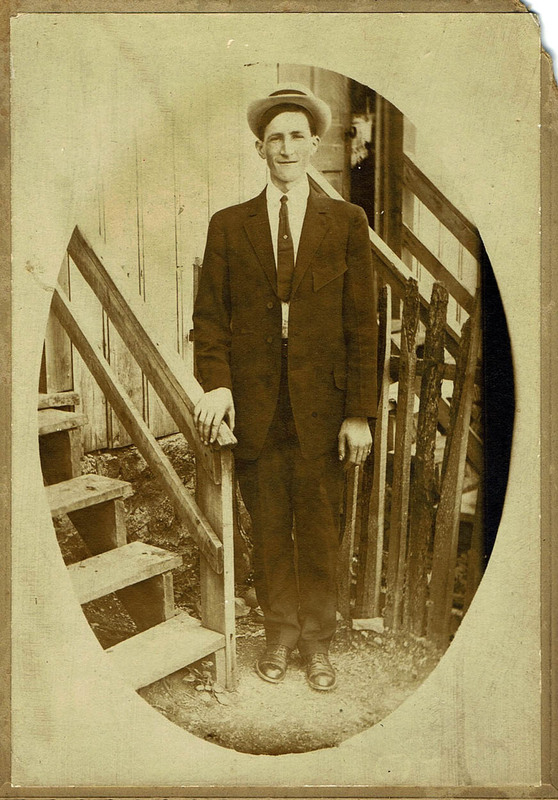 Photograph courtesy of Helene Smith Prehatny, first cousin of Lawrence and Ralph Genetti. 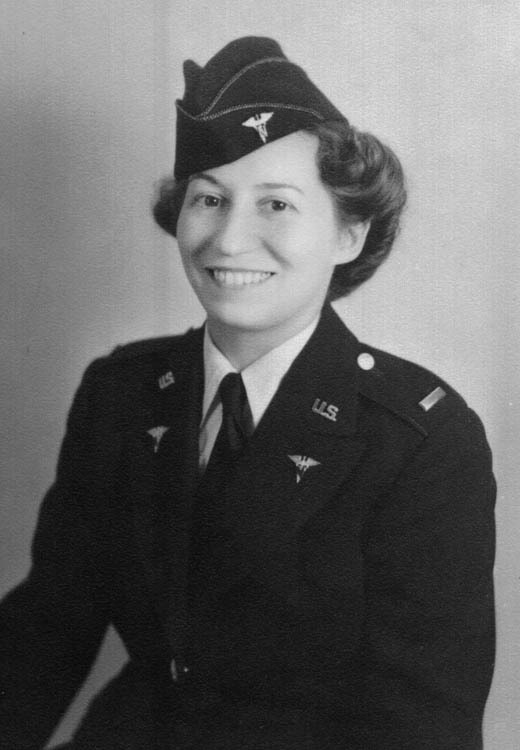 Anna Genetti Nensteil (1909 – 1974). Daughter of Raffaele and Lucia Genetti. Date unknown. Photograph courtesy of Helene Smith Prehatny, niece of Anna Genetti Nensteil. 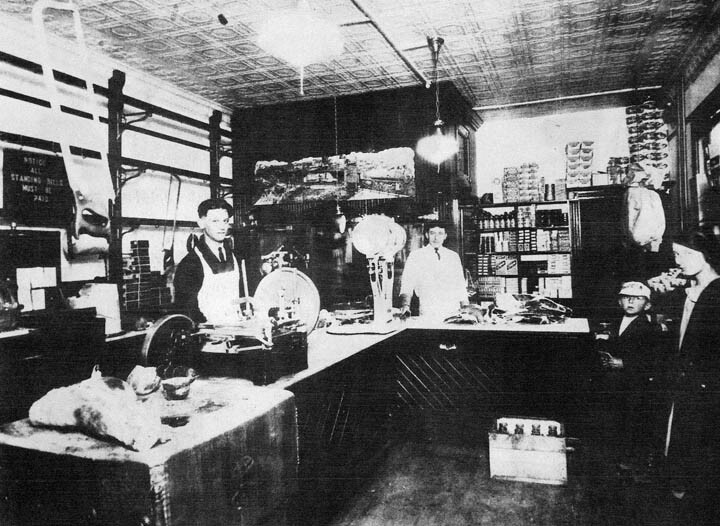 1921 – one of the original Genetti stores located in Hazleton Heights. The store was operated by Leon Genetti. Stanley Genetti is at the counter. 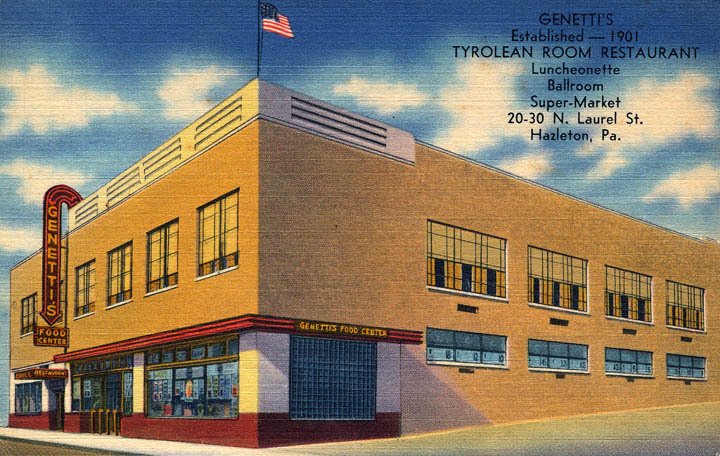 Postcard used to advertise Genetti’s Food Center once located on N. Laurel Street in Hazleton, PA. 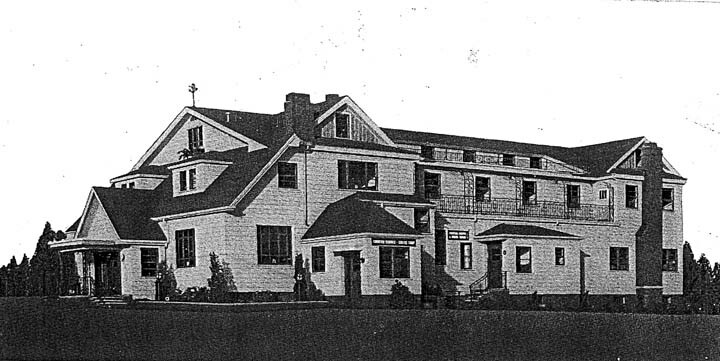 The building included one of the area’s first super markets, a luncheonette, ballroom and The Tyrolean Room (bar and restaurant). The postcard was issued sometime between 1939 and 1945. 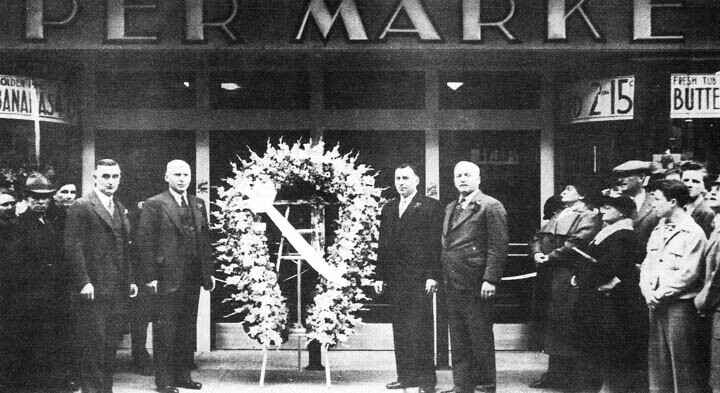 Photograph of the four Genetti brothers at the grand opening of the Laurel Street market, 1939. From left to right: Albert, Gus, Stanley and Leon. 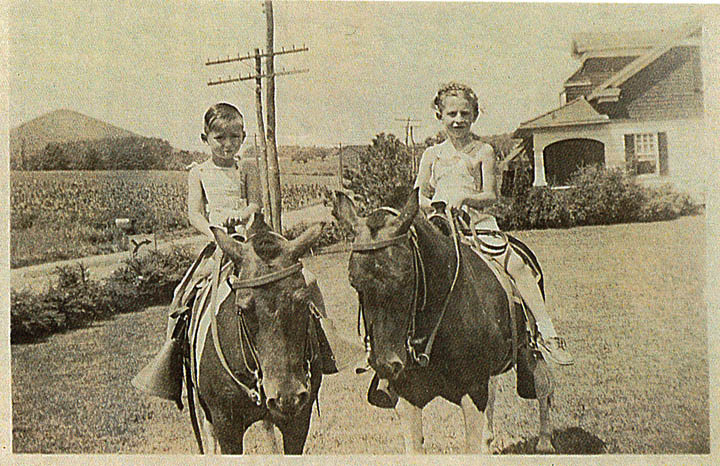 Cousins Bill Genetti and Jean Branz riding horses on the Genetti farm, 1940. Photograph is courtesy of Jean Branz Daly. Jean’s mother was Erminia Genetti Branz, one of Damiano’s five daughters. 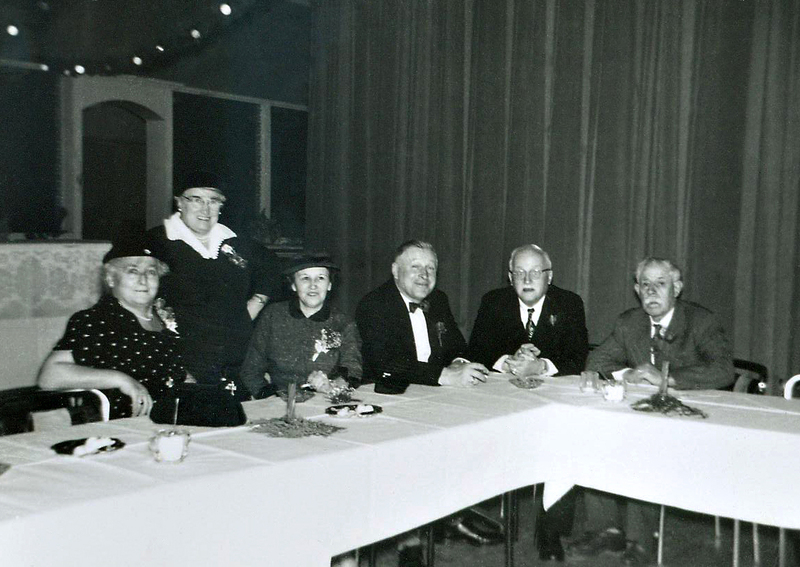 Joseph E. Genetti (with black hat) and the staff at the Tyrolean Room. 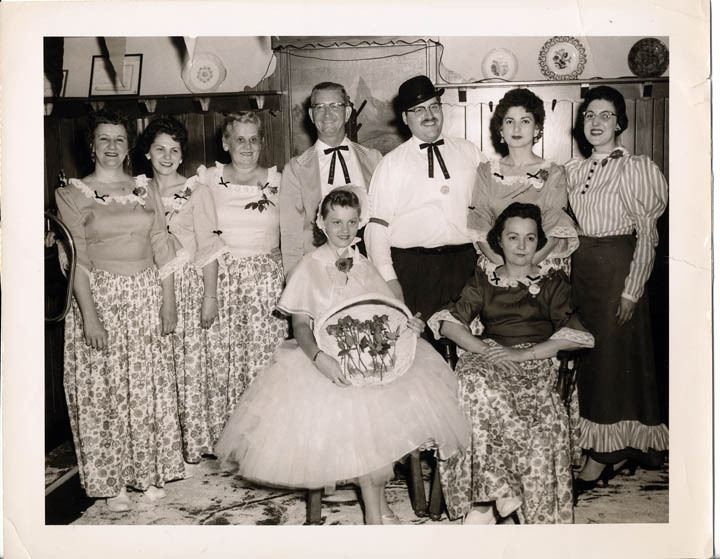 Dressed in period outfits for Hazleton’s Centenial Celebration, circa 1957. Opened in 1950, Gus Genetti’s Hotel and Restaurant of Distinction located in Hazleton, Pennsylvania. Gus’s son, Bill Genetti, took over the restaurant from his father in the 1970’s, managing it until his retirement in 2015. Above, 1950’s advertisement for Gus Genetti’s Hotel and Restaurant. 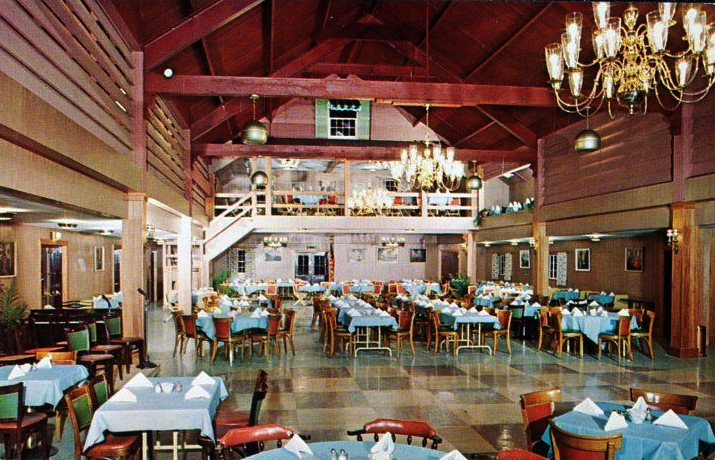 Grand Ballroom of Gus Genetti’s Hotel and Restaurant in Hazleton, circa 1964. 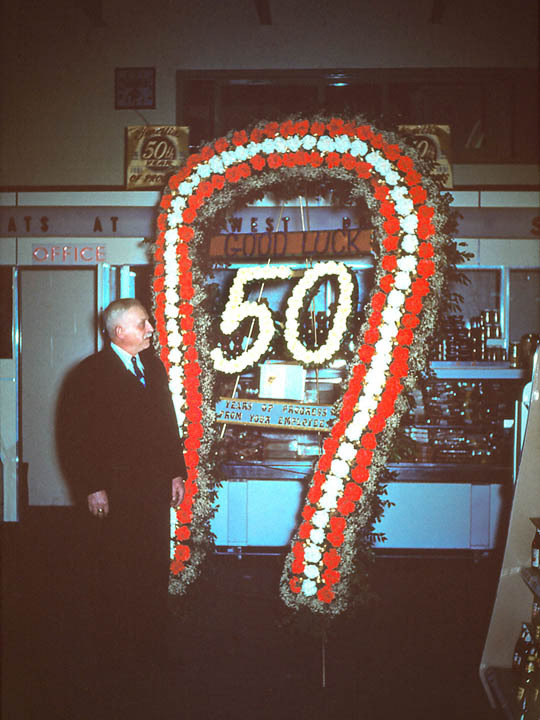 Leon Genetti pictured at 50th Anniversary Celebration of D. Genetti and Sons, circa 1951. Photograph courtesy of Joseph E. Genetti. 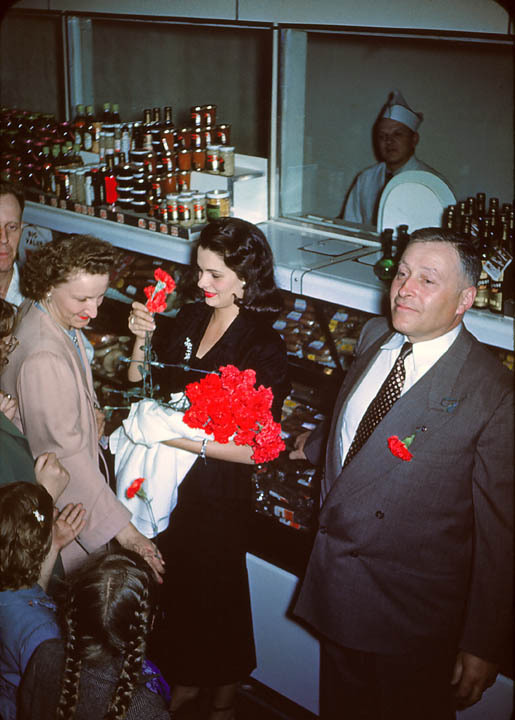 Stanley Genetti with Miss America handing out roses at Laurel Street Genetti Market to celebrate the 50th Anniversary of the company, circa 1951. Leone and Angeline Genetti’s 40th wedding anniversary in 1954. A casual group of family chatting after the anniversary dinner. 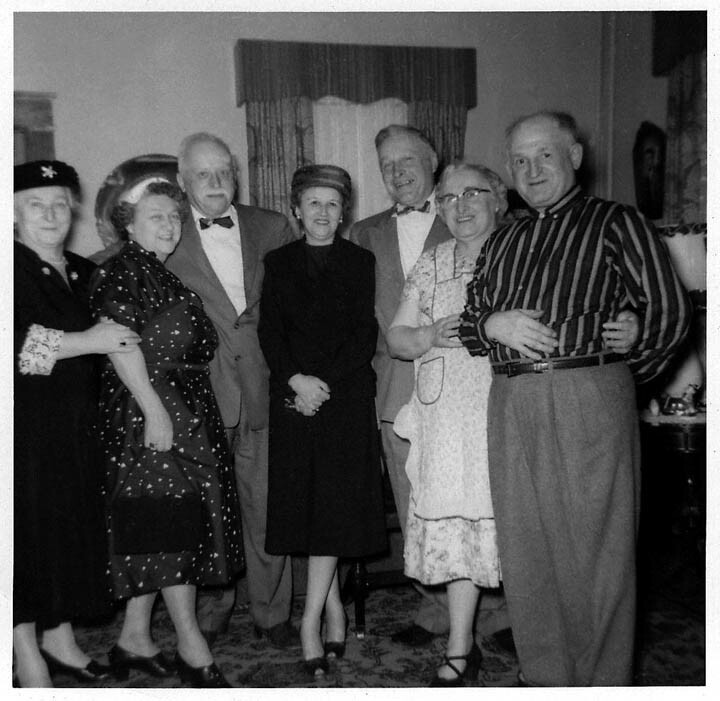 L to R: Dora Bott, Erma Branz (standing), Eleanor Genetti (wife of Stanley), Stanley Genetti, Leone Genetti and Verecundo Bott (husband of Dora). Note: Leone, Dora, Stanley and Erma were all siblings and the children of Damiano and Oliva Genetti. 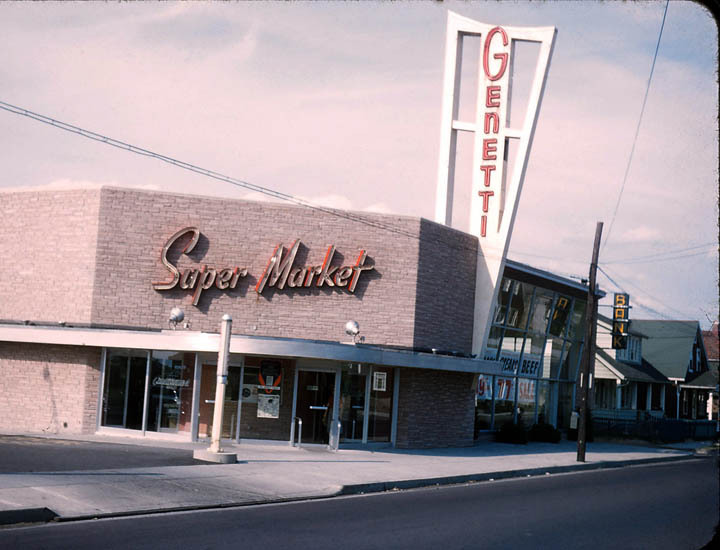 Genetti Super Market located on 15th Street in Hazleton, PA. Opened in 1954. 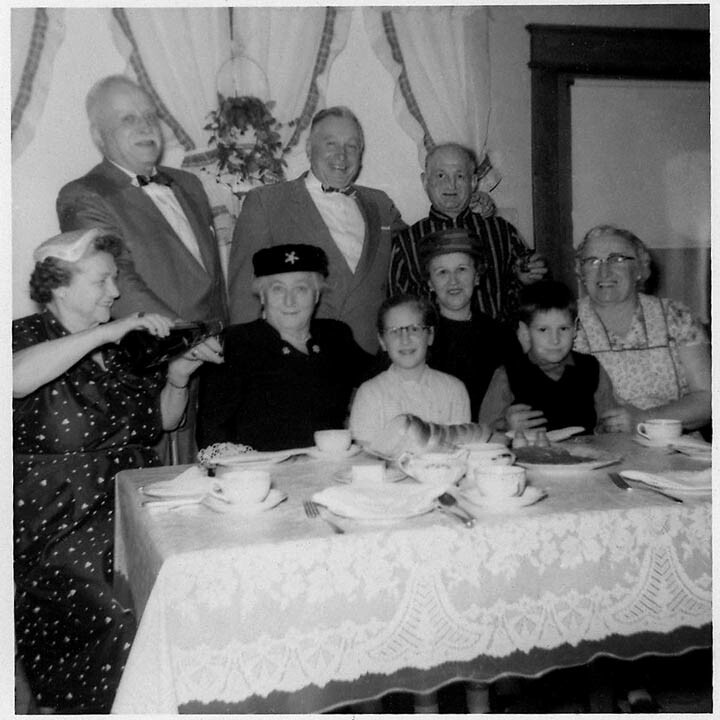 A family gathering at the home of Erma and Henry Branz’s, 1957. 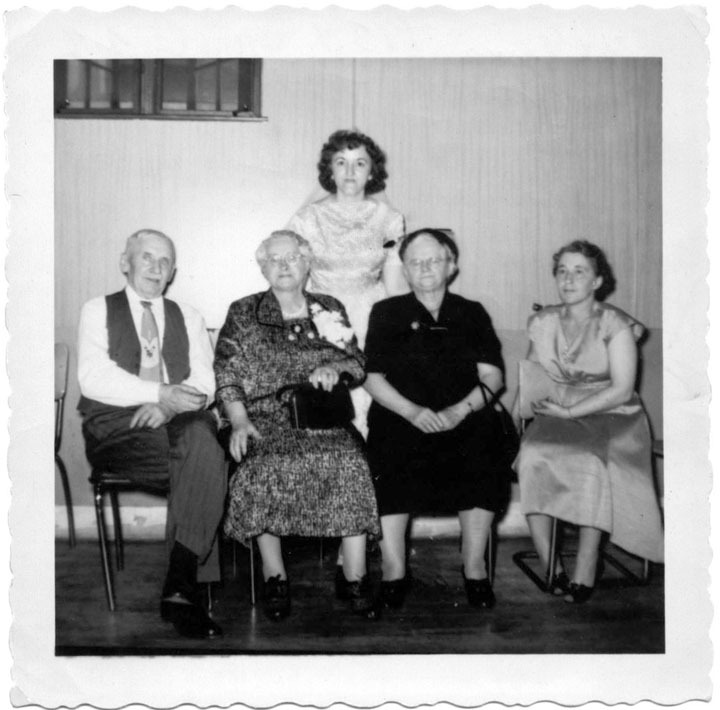 Left to right seated: Angeline Genetti (wife of Leone), Dora Bott, Judith LaPorte (granddaughter of Erma and Henry), Eleanor Genetti (wife of Stanley), Joseph LaPorte (grandson of of Erma and Henry), Erma Branz. Left to right standing: Leone Genetti, Stanley Genetti, Henry Branz. 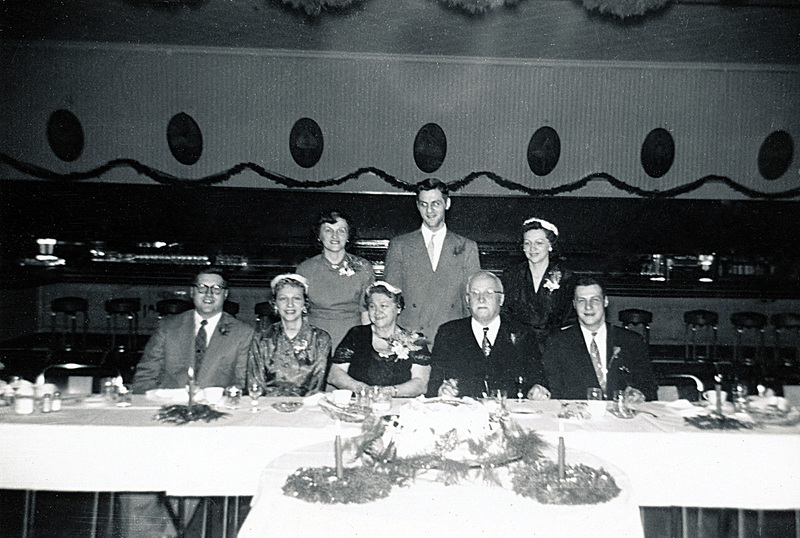 Another grouping from the same family dinner as above, 1957. 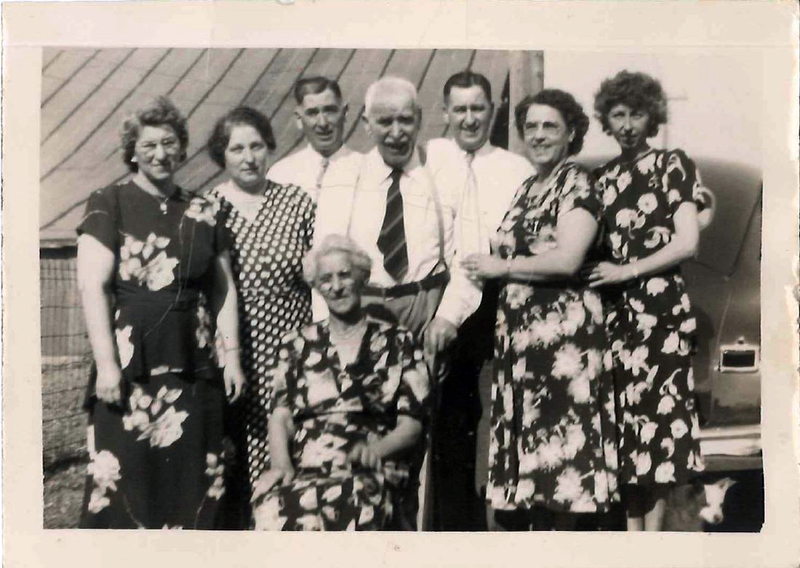 Left to right: Dora Bott, Angeline Genetti (wife of Leone), Leone Genetti, Eleanor Genetti (wife of Stanley), Stanley Genetti, Erma Branz, Henry Branz. Photographed at Gus Genetti’s Restaurant and Hotel, probably in the early 1960’s. 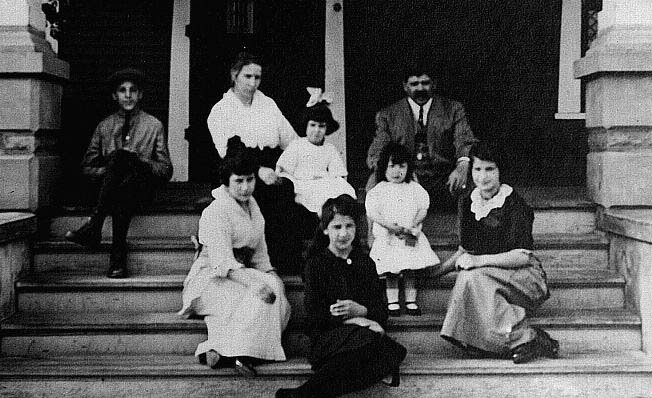 Standing left to right: Dora Genetti Bott, Tillie Genetti Zambotti, Gus Genetti, Peter Zambotti, Ann Genetti McNelis, Erma Genetti Branz and Henry Branz – four sisters and a brother (people seated are not family). Three Genetti sisters: Erma, Dora and Tillie. Circa 1968. Standing: Jean Branz Daly and Leona Zambotti. Seated: Ann Genetti McNelis, Tillie Zambotti and Catherine Branz La Porte (Jean and Catherine are sisters and the daughters of Ermina Genetti Branz.) Ann Genetti McNelis was the youngest daughter of Damiano and Oliva. She lived to be 102 years old! Circa 1977. Angela (Ann) Maria Genetti McNelis (1903-2005) with Dale Genetti. Photographed at Christmas reunion of Genetti family (date unknown). Aunt Ann was Damiano and Oliva Genetti’s youngest child. She lived to be 102 years old, most likely the longest living member of the Genetti family! Photograph is courtesy of Dale Genetti, the great niece of Ann Genetti McNelis. Finally I have several photos from our Italian family! 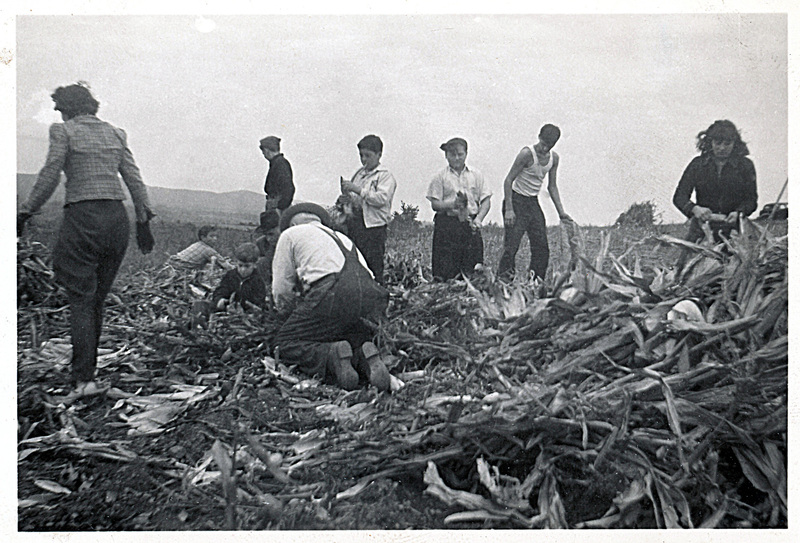 This photograph was taken in the meadows that are part of the Commune of Castelfondo in 1959 or 1960. 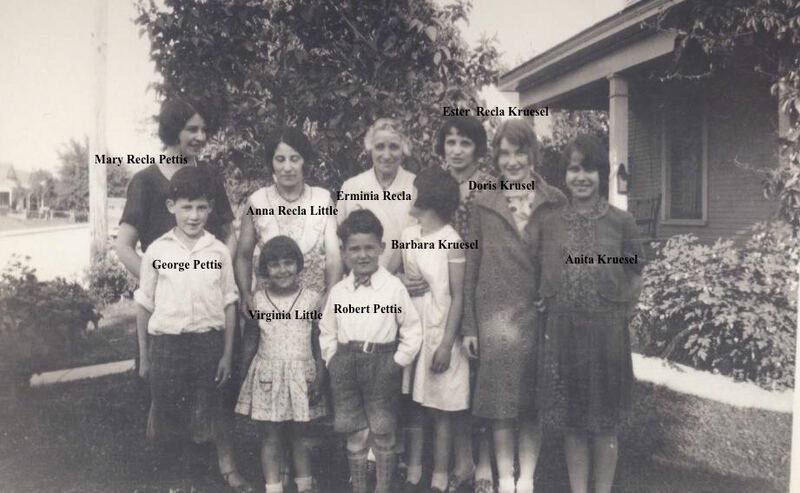 Info provided by Laura Martellato and her mother Lidia Genetti: From far right: Francesca Genetti (Lidia’s father’s sister/aunt to the Genetti sisters), then a neighbor, Lidia Genetti (Laura’s mother), Maria Genetti (Laura’s aunt/Lidia’s sister) and in front of Maria, the young girl is Luciana Genetti (Laura’s aunt/Lidia’s sister). The rest of the group are neighbors of the Genetti’s. See the three Genetti sisters (Maria, Lidia and Luciana) as they appear in one of my blog posts from Sept. 2014, click here. Photograph courtesy of Dino Marchetti and Lidia Genetti. The couple seated in front is Adriano Genetti and his wife Tullia Piazzi, parents of the Genetti sisters: Maria, Lidia, Luciana and Adriana. The smiling woman behind them is Francesca Genetti, Adriano’s sister. The photo was taken in Sous (on the mountain near Castelfondo), probably during a family outing. Circa 1942. Note: Adriano was Damiano Genetti’s first cousin, once removed or second cousins with my grandfather, Leone Genetti. Photographed in Castelfondo sometime in the late 1950’s. This is Mainrado Genetti, brother of Adriano. The father of Mainrado and Adriano, Valentino Genetti, was Damiano Genetti’s first cousin. The church choir of Castelfondo, probably photographed in the late 40’s or early 50’s. Right to left: Bianca Genetti, Basilio Marchetti, Eligio Ianes, Carol (Carleto) Stancher, Camillo Genetti, Tullio Cologna, Giuseppe Genetti, Vittorio Marchetti, Albino Morandi, Ferdinando Corazza, Luigi Genetti, Emilio Marchetti, Narciso Genetti, Attilio Morandi, Luigi (kimpil) Marchetti, Emilio Morandi. Kneeling: Flavio Cologna, Giuseppe Stancher, Angelo Corazza, Marino Segna. Photograph courtesy of Giovanni Marchetti and Chei da Chastelfon (Facebook group: People from Castelfondo). 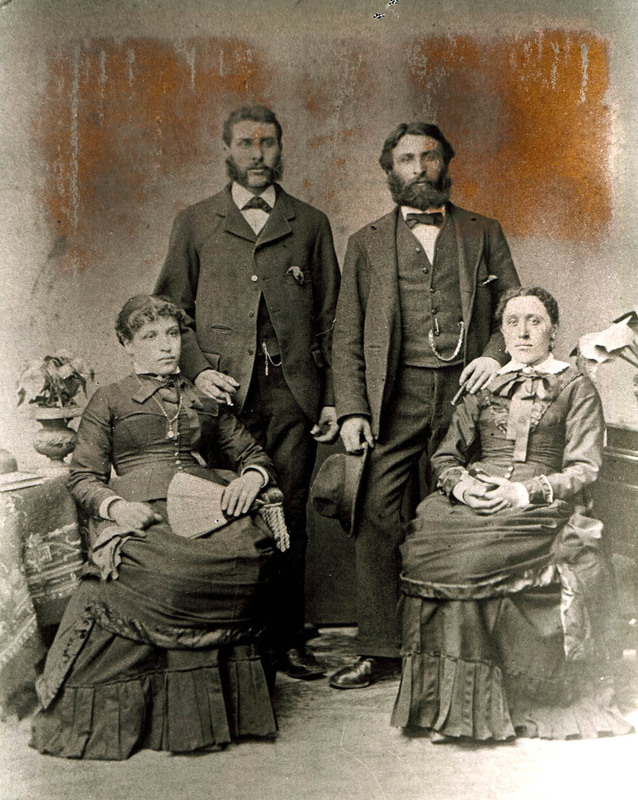 Angelo Genetti (1859-1946) and his wife Teresa Anunziatta Marchetti (1858-1902), parents of the four brothers (see below) who settled in Wyoming, USA. First row: Francesco “Frank” Giacinto Genetti (1884-1974) and Enrico Giovanni Genetti (1886-1941). 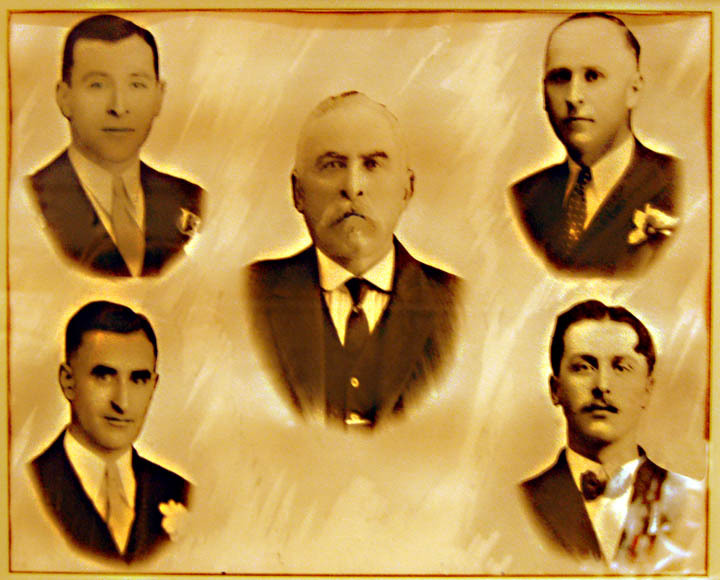 Second row: Ermenegildo “Herman” or “Joe” Genetti (1893-1967) and Dominico “Dominic” Dionigio Genetti (1895-1966). 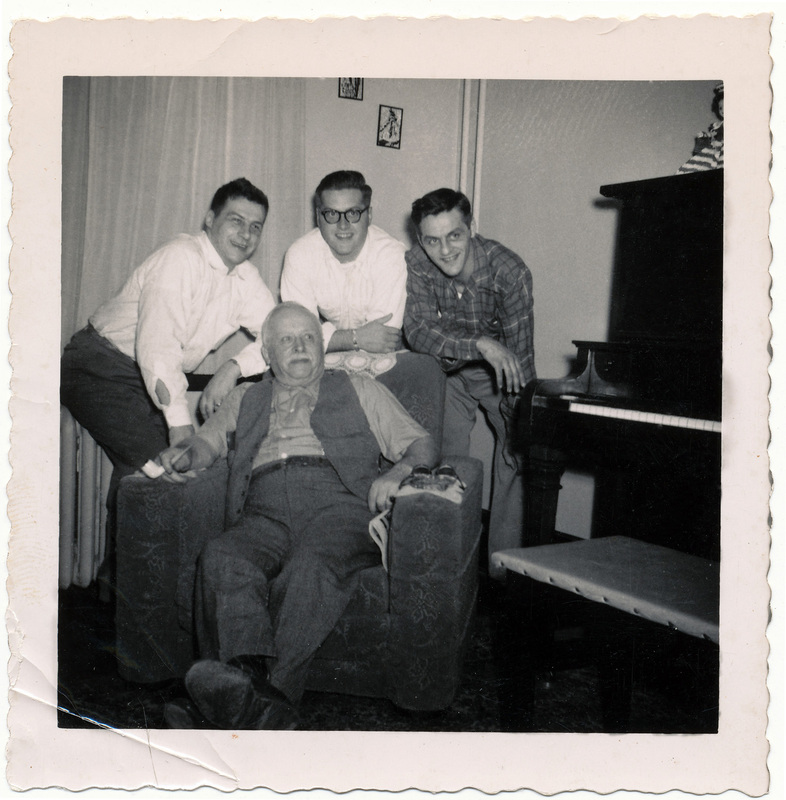 The four brothers are the founding ancestors of the Wyoming branch of the Genetti family. Photographs courtesy of Alexandra and Ken Genetti. 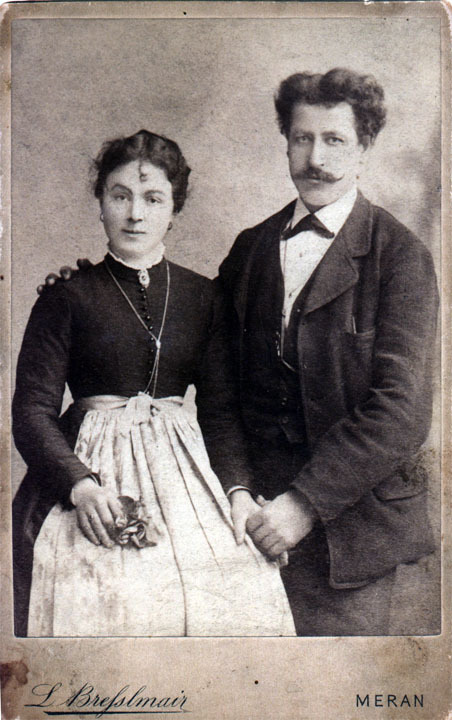 William Vigilio Genetti with his first wife Maria Dolzadelli. Born in Castelfondo in 1852 to Cipriano and Catterina Genetti, his baptismal name was Vigilio, but he later adopted a more Americanized name of William. He settled in Collinsville, Illinois sometime around 1888. Maria died in 1907 and William remarried. Today there are many descendants of Vigilio living in the United States. Photograph courtesy of Brian Genetti. 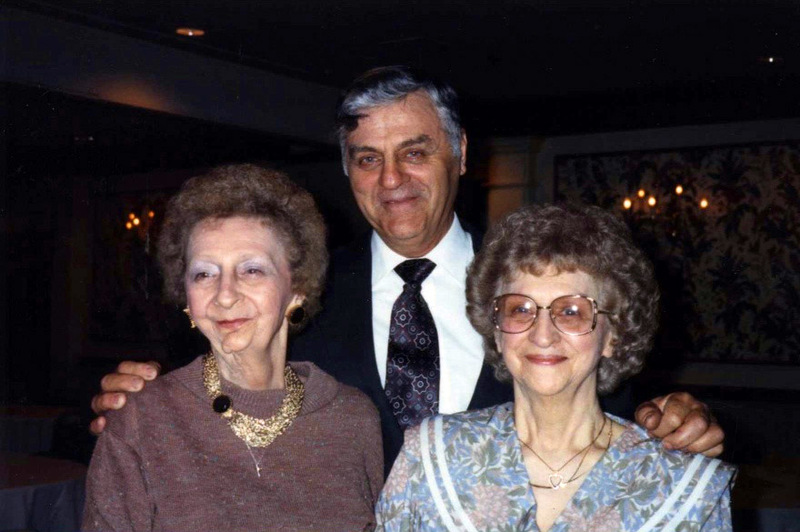 Left to right: Angela Genetti, Ralph (Raffael) Recla, Peter Zambotti and Anna Maria (Mary) Genetti. Angela, the sister of Damiano and Rafaele Genetti, was married to Ralph. Peter was married to Mary, Angela’s older sister. There is no date for this photo, but it may have been Peter and Mary’s wedding that took place in January of 1896. If this is the case, Angela and Ralph Recla may have been their witnesses. 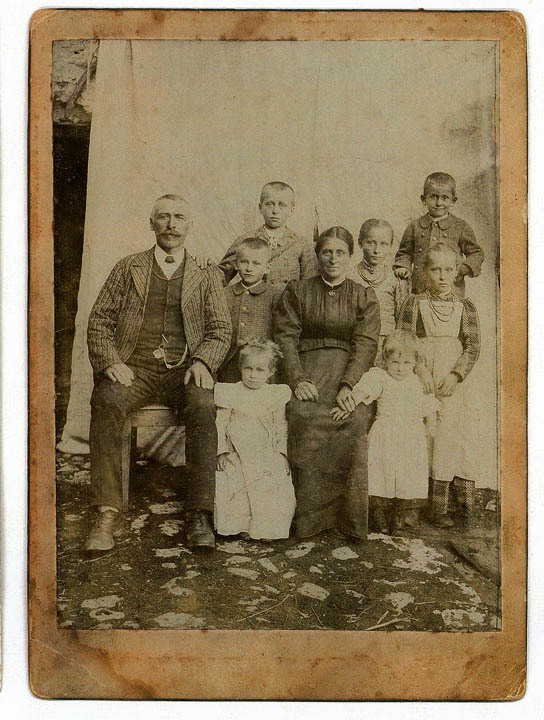 By November of 1896 Ralph was deceased, leaving Angela with six young children. Photograph courtesy of Don and Joyce Lingousky. Portrait of Angela Maddalena Genetti Recla. This is a pencil or charcoal drawing of a young Angela created by her adopted son Henry Parisi Recla. According to Angela’s great-grandson, Don Lingousky, Henry was adopted from St. Joseph’s Foundling Home by Angela around 1906 as a young child. Angela said she had prayed for a favor and promised to adopt a child if what she prayed for came true. Original cabinet card of: Raffael Recla (1864-1896) with wife Angeline Maddalena Genetti (1865-1937), children: Lawrence (1887-1963), Leonela (1890-1979) and Frances (1888-1937). This picture postcard was sent to relatives in Tyrol. It was also used as the model for the charcoal portrait shown above of a young Angeline Maddalena Genetti Recla. Photograph courtesy of Giovanni Marchetti of Castelfondo, Italy. Angela Maddalena Genetti Recla, the daughter of Leon and Cattarina Genetti (sister of Damiano and Rafaele). 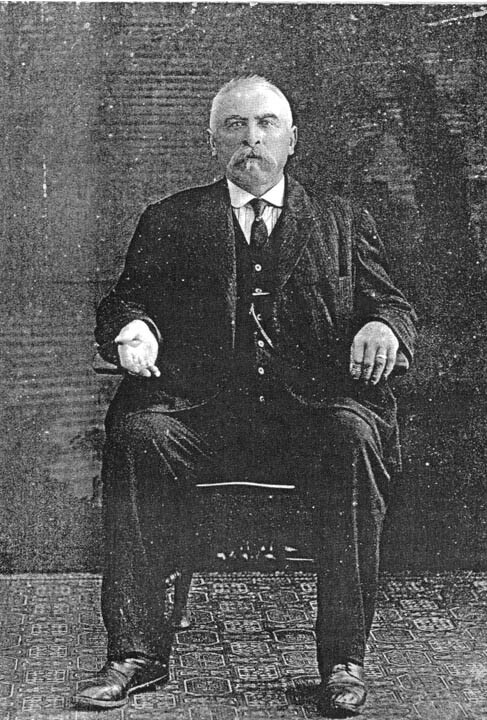 Portrait taken late in life. Born: 25 Dec 1865 – Death: 18 May 1937. Angela’s sister Erminia Enrica Genetti married Emanuel Recla, brother of Angela’s husband Raffael Recla (two sisters married two brothers). Leonela Erminia Recla Lingousky, daughter of Angela Genetti Recla, the third born of six children. Born: 2 Nov 1890 – Death: 18 Jan 1979 in Sheppton, Pennsylvania. 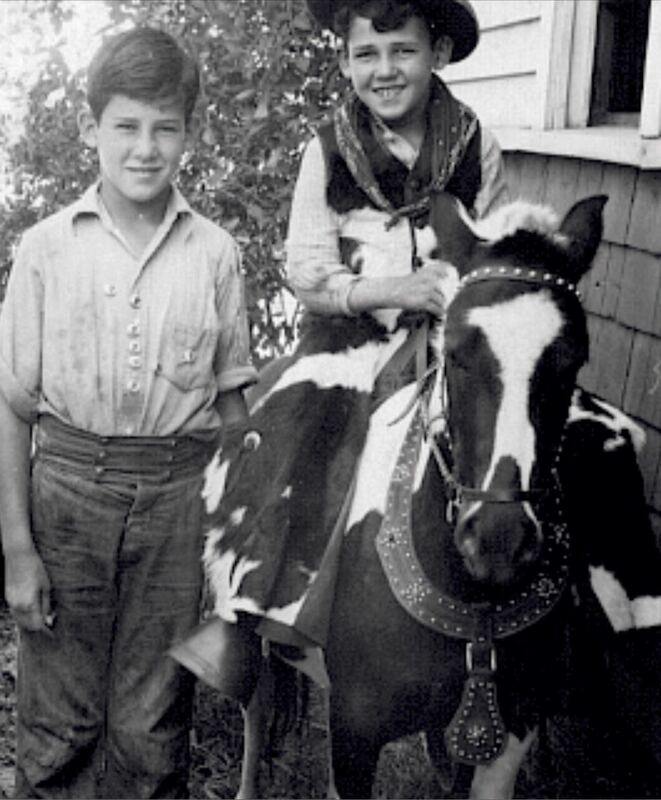 Leonela was an accomplished seamstress, married Bernard T. Lingousky and had three children: Angeline (died as a young child), Francis Ralph (1919 – 2011) and Bernardine (1922 – 2014). Bernard Thomas Lingousky, husband of Leonela Recla. Born: 11 Oct 1886 – Death: 3 Aug 1957. Bernard married Leonela on June 30th, 1913. The couple lived in Hazleton and West Hazleton, PA. Bernard worked as a coal miner and later died of black lung disease. 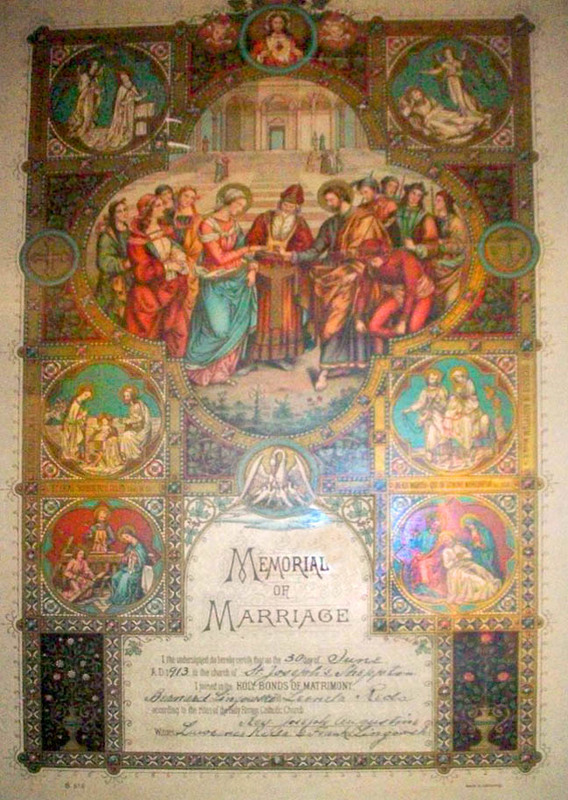 This beautiful memorial commemorated the marriage of Bernard T. Lingousky to Leonela Erminia Recla – June 30th, 1913. 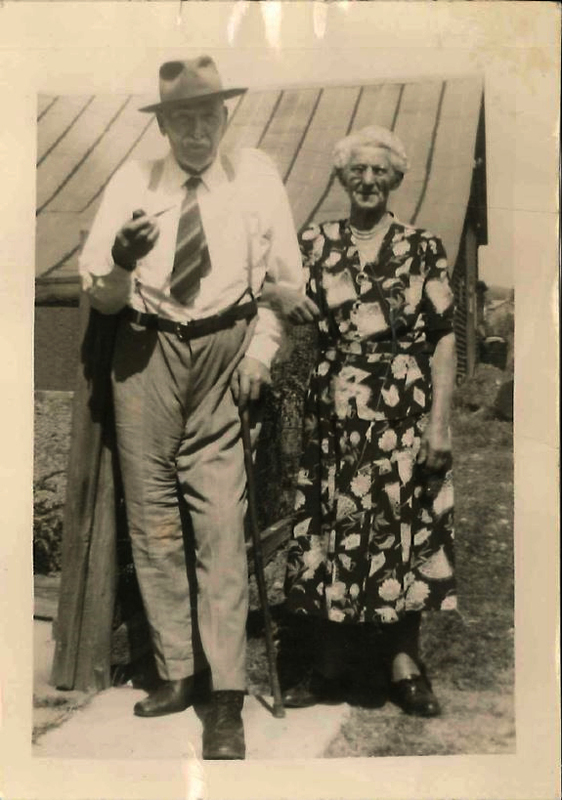 Francis Ralph Lingousky, (1919-2011), son of Leonela and Bernard, with his wife Anne Carmel Chescattie Lingousky (1909 – 1956) – parents of Don Lingousky. Both served in the service during WW II. Photographs courtesy of Don and Joyce Lingousky. 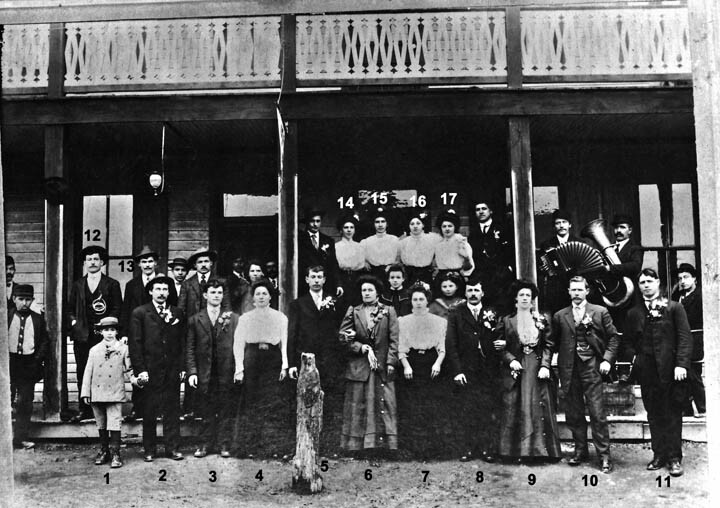 Erminia Genetti Recla and husband Emanuel Recla with family in Spokane, WA – 1914. 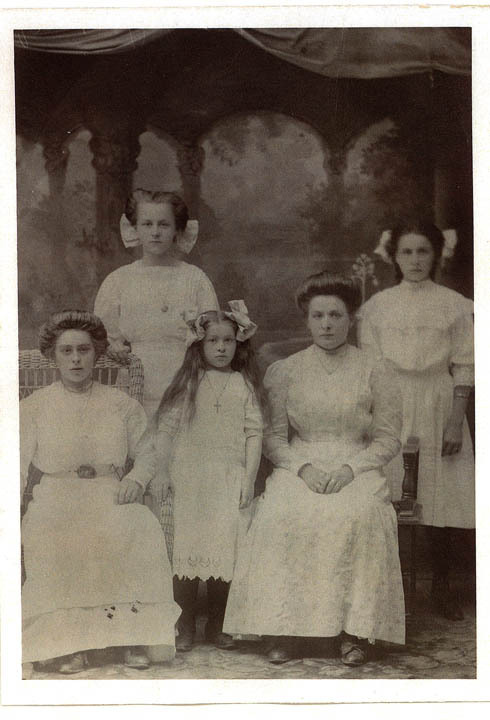 The children include Ralph, Catherine (in lap), Elaine (standing), and the three older daughters: Esther, Marie and Emma. 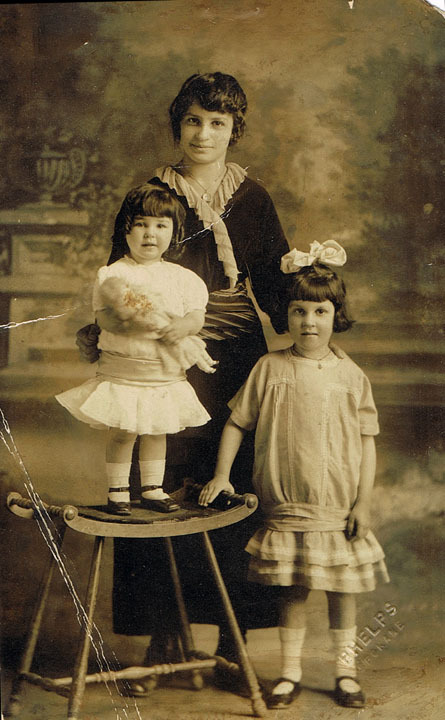 A beautiful postcard of Elaine (1912-1982) (on stool), Emma (1899-1988) and Kathryn (or Catherine) (1909-?) Recla, children of Erminia Enrica Genetti (1876-1972) and Emanuel Recla (1866-1939). This was a formal portrait taken by the Phelps Studio in Spokane, WA, probably around 1915. According to the 1930 Federal Census, Kathryn Recla had entered the St. Joseph Convent in Muscatine, Iowa and was listed as a music teacher. Unfortunately we loose track of her after this and she does not appear in the 1940 census. After she took her vows, her name may have changed to Sister Dolerette. 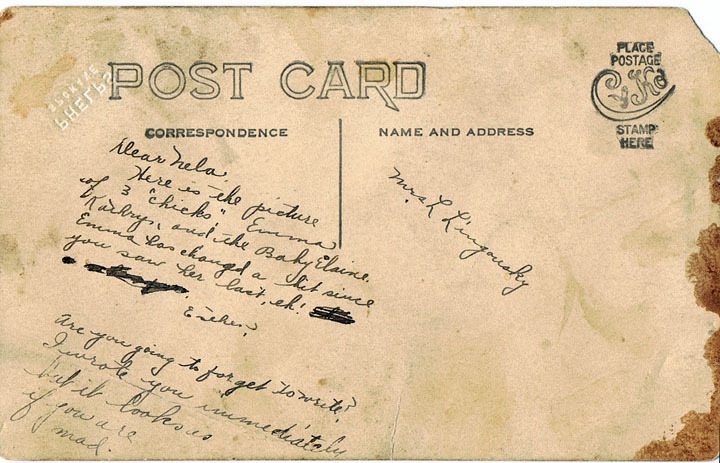 Back side of postcard (see above). The postcard was sent by Erminia Genetti Recla in Spokane, WA to her niece, Leonela Recla Lingousky in Hazleton, PA.
Emma “Anna” Recla Little (1899-1988), daughter of Erminia Genetti and Emanual Recla, with daughter Virginia Little (1922-1951). Photograph courtesy of Linda Pettis Sullivan, (great-granddaughter of Erminia Genetti and Emanuel Recla). Catherine Recla (1909-1989), daughter of Erminia Genetti and Emanuel Recla. 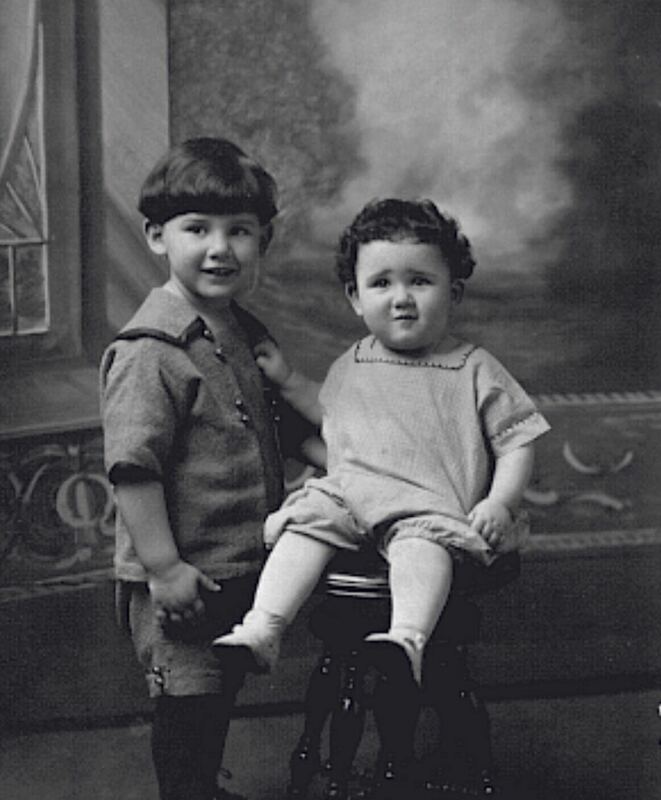 Elaine (1912-1982) and Eugene “Gene” Recla (1915-2003), children of Erminia Genetti and Emanuel Recla. 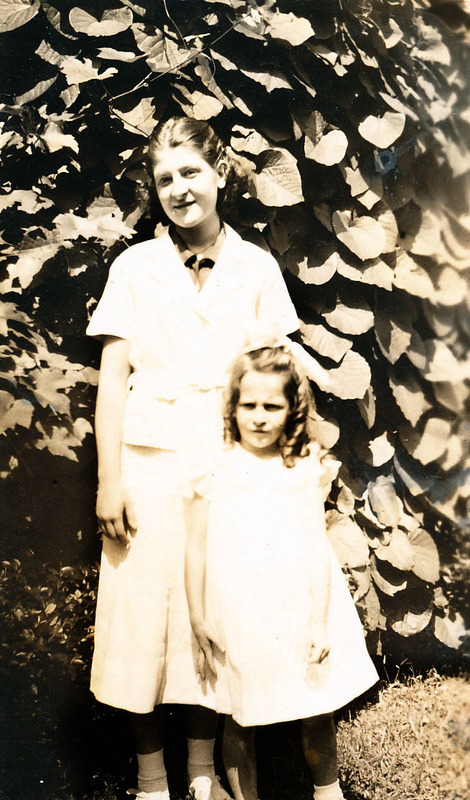 Elaine (1912-1982) and Catherine Recla (1909-1989), children of Erminia Genetti and Emanuel Recla. 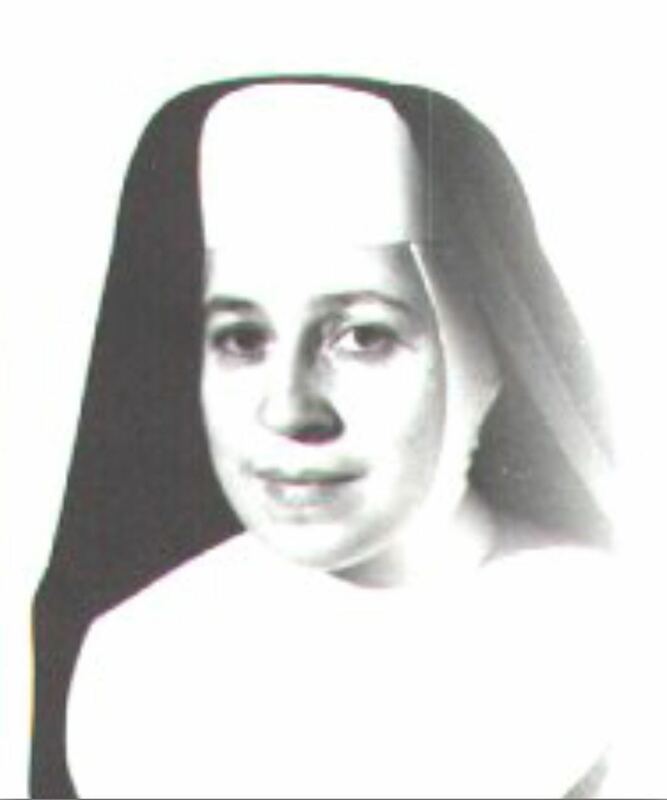 Catherine Recla (1909-1989) became a nun (Sister Dolorette), daughter of Erminia Genetti and Emanuel Recla. Emanuel Recla (1866-1939) with his daughter Catherine (Sister Dolorette). 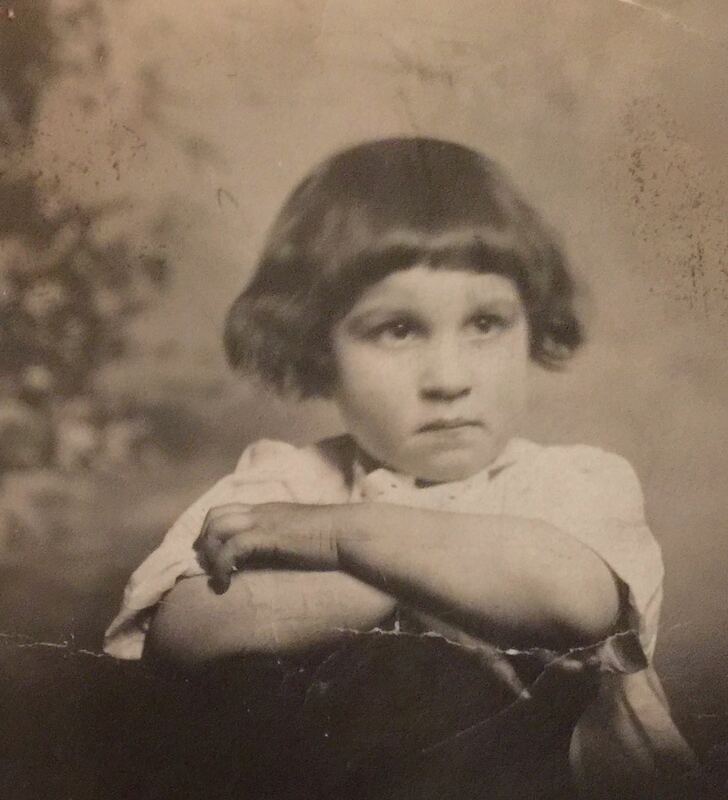 Marie “Mary” Louise Recla (1903-1940), daughter of Erminia Genetti and Emanuel Recla. 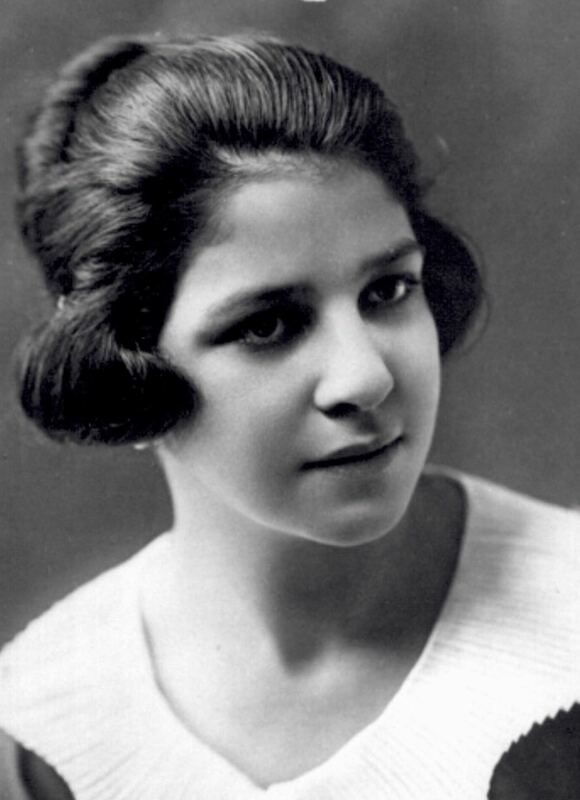 Mary Recla (1903-1940), daughter of Erminia Genetti and Emanuel Recla, high school portrait. 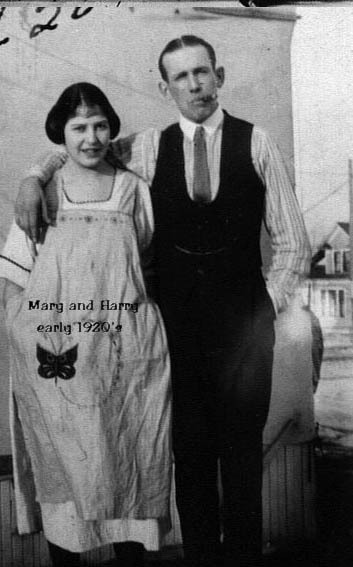 Marie “Mary” Louise Recla (daughter of Erminia Genetti Recla and Emanuel Recla) with her husband Harry Pettis. Photo taken in the early 1920’s soon after they were married. Marie is Mary Russell’s grandmother. 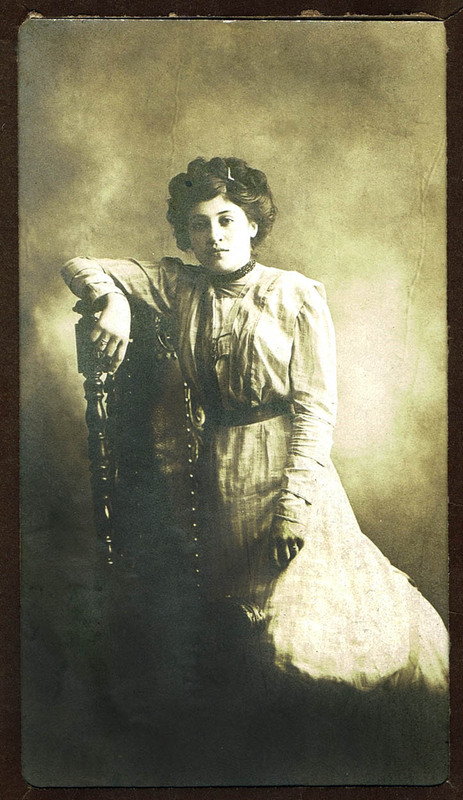 Erminia Enrica Genetti, born: 1876 in Castelfondo, Austria (Italy) – death: 1972 in Spokane, Washington. Erminia was the youngest child of Leone and Cattarina Genetti. 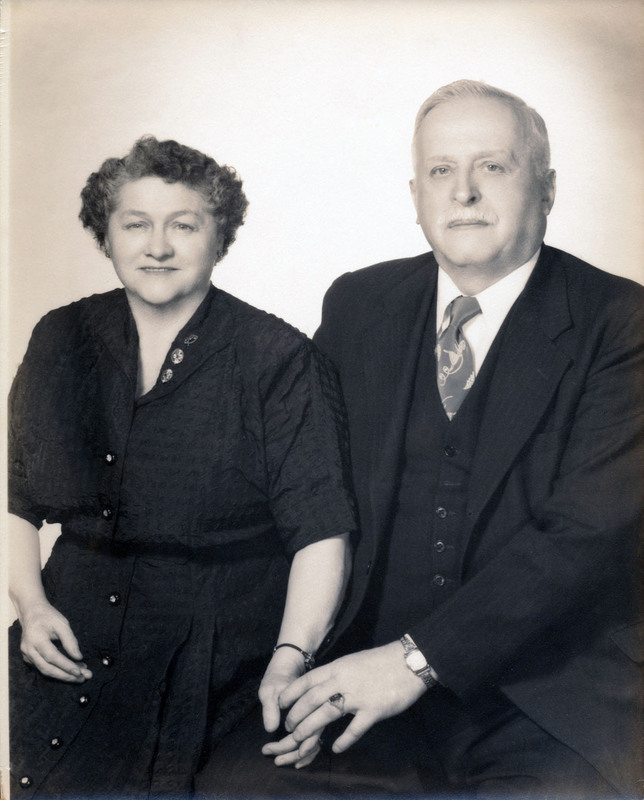 Eugene “Gene” Paul Recla (1915-2003), son of Erminia Genetti and Emanuel Recla, with his wife Ruth K. Berven (1914-1990). Elaine Dorothy Recla Tibessart (1912-1982), daughter of Erminia Genetti and Emanuel Recla. Photograph courtesy of Linda Pettis Sullivan, (great-granddaughter of Erminia Genetti and Emanuel Recla, daughter of Robert Harry Pettis). The Recla women with their children. Front Row (L to R): George Pettis, Virginia Little, Robert Pettis, Barbara Kruesel, Doris Kruesel, Anita Kruesel. Back Row (L to R): Mary Recla Pettis, Anna Recla Little, Erminia Genetti Recla, Ester Recla Kruesel. Photographed 1930. 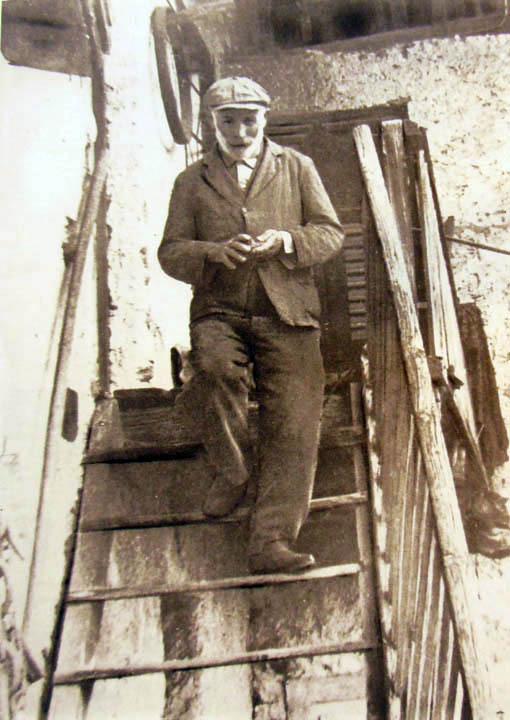 The mysterious Giuseppe “Joseph” Genetti (1862 – ?). Son of Leone and Cattarina Genetti, brother to Damiano, Raffaele, Maria, Angela and Erminia. 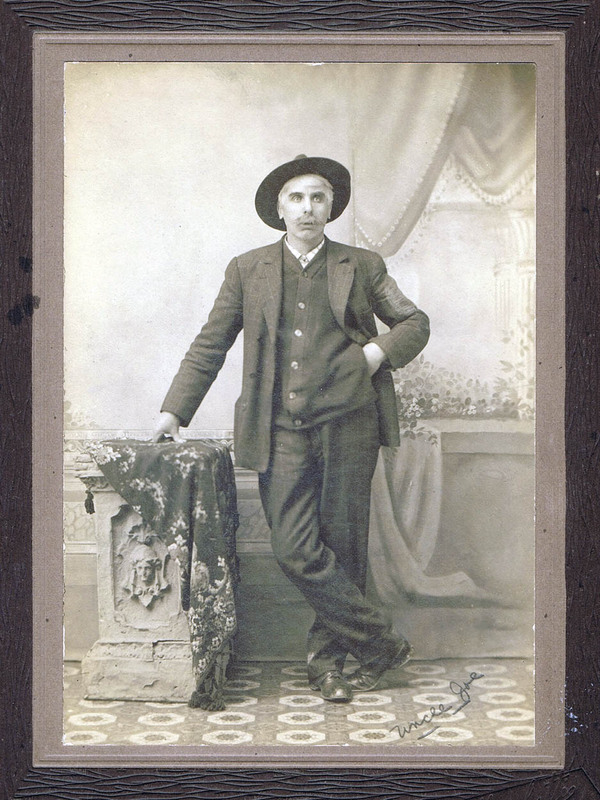 Giuseppe emigrated to the United States in 1882 at the age of twenty. Sometime around the turn of the century, he left to seek his fortunes in the west and was never heard from again. 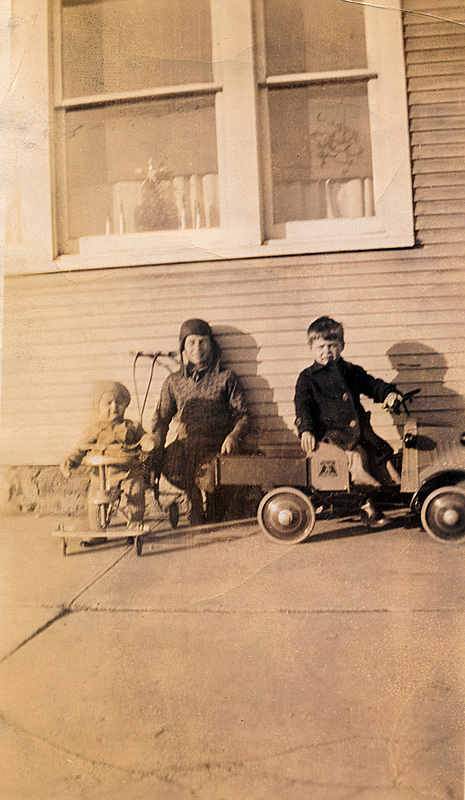 The three sons of Leon and Angeline Genetti, photographed in Hazleton, PA about 1931. Pictured are Joseph (1931-1986), John (1919-1981) and Leon (1928-2017). Photograph is courtesy of Louise Genetti Roach. 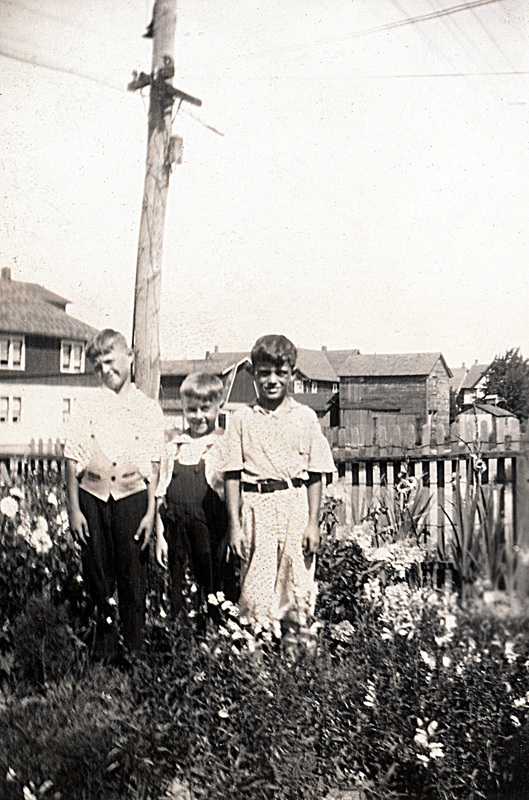 A later photo of Leon and Angeline Genetti’s sons, photographed in their backyard in Hazleton Heights on Poplar Street, about 1936. Pictured are John (1919-1981), Joseph (1931-1986) and Leon (1928-2017). Leone Alessandro Genetti (1887 – 1962) and Angeline L. Marchetti Genetti (1893 – 1963). Leone was the oldest child of Damiano and Oliva (Zambotti) Genetti. Angeline was the ninth child in a family of ten. Her parents were Giovanni Battista Marchetti and Catterina Lucia Fellin. Leone was born in Latimer, PA but grew up in Castelfondo, Trentino before emigrated back to PA at the age of 17. 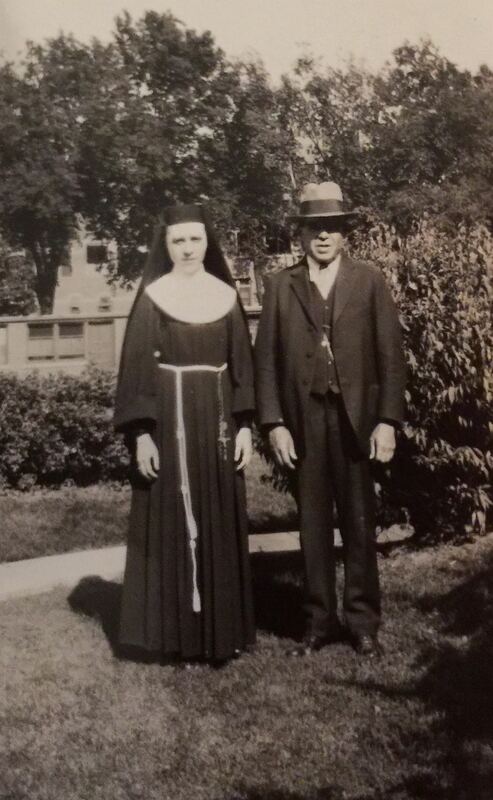 Angeline was born in Nuremberg, PA. She married Leone on the 17th of December 1914 in Hazelton, PA. Date of photo: early 1950’s. Leon Genetti (1887-1962) with his three sons: John (1919-1981), Joseph (1931-1986) and Leon (1928-2017). 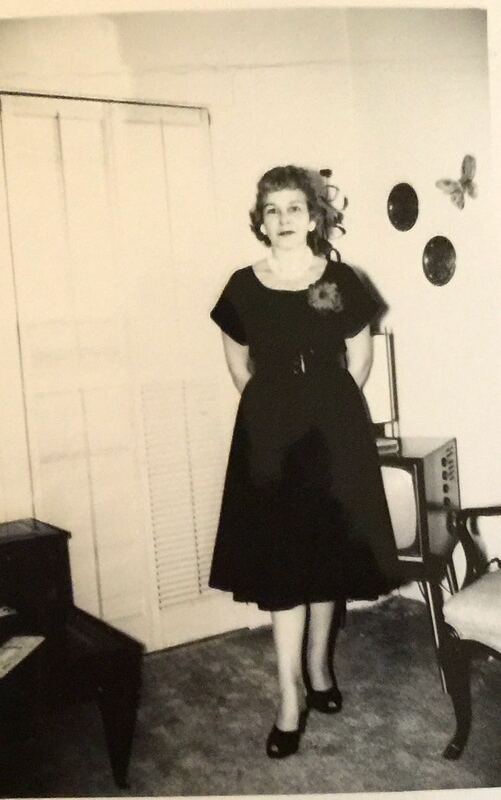 Photographed in the living room of their Poplar Street home in Hazleton, PA, probably around the mid-1950’s. Ottilia Anna “Tillie” Genetti (1890-1985) and Pietro “Peter” S. Zambotti (1881-1966). Formal portrait most likely photographed around the time of their marriage in 1911 in Pennsylvania. Tillie was the daughter of Damiano and Oliva Genetti. Peter was the son of Simone Zambotti and Catterina Dallachiesa. 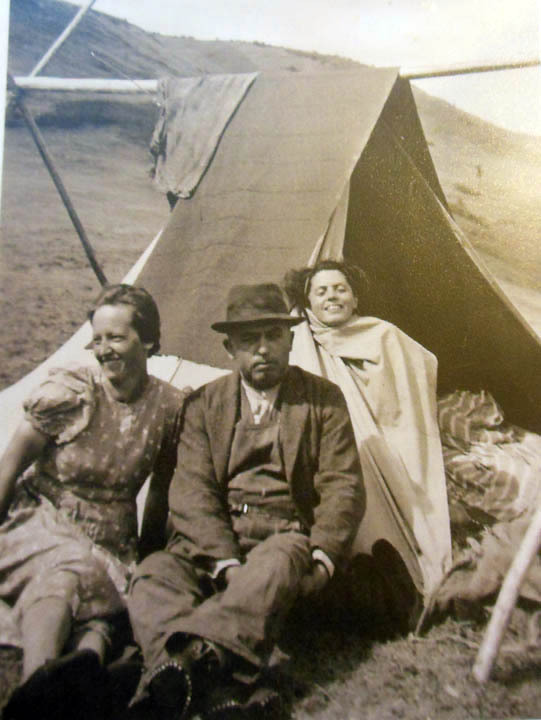 Both Tillie and Peter were born in Castelfondo, Tyrol before emigrating to Pennsylvania at a young age. 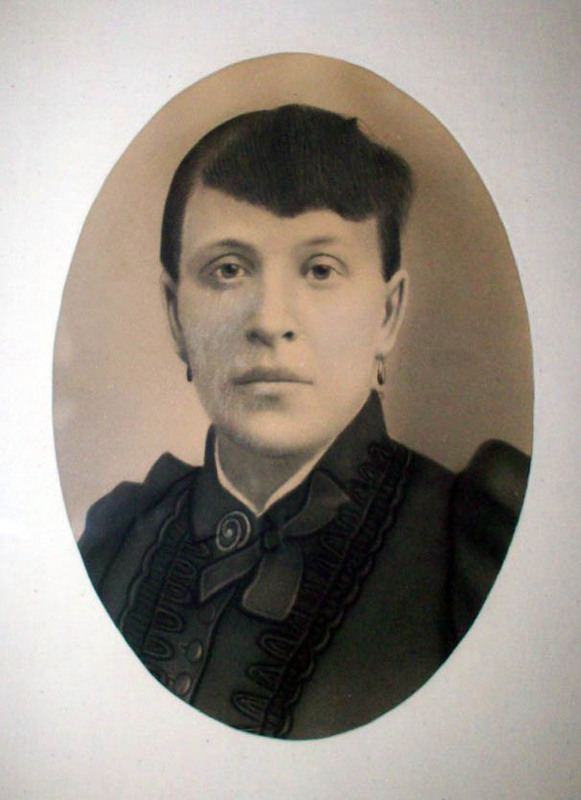 Tillie and Peter’s first child, Elizabeth (Reich), was born in the Genetti home on Fulton Court in Hazleton. 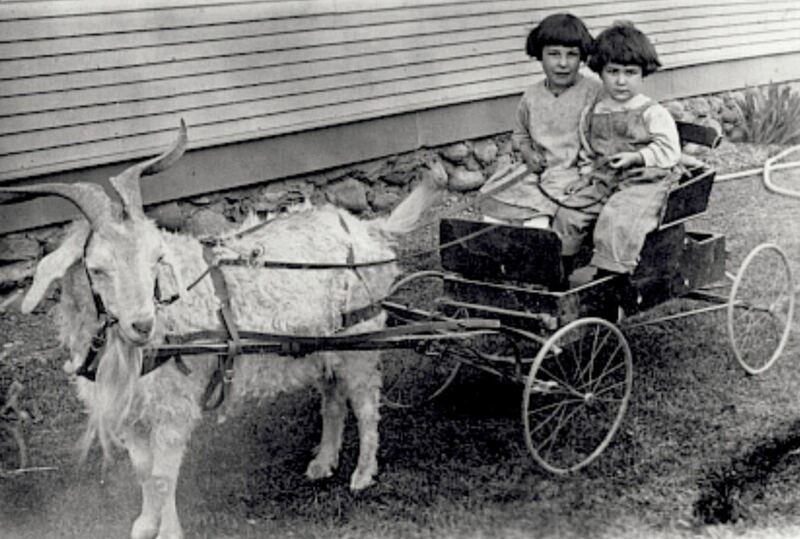 The Zambottis then moved to Weston, PA where three more children were added to the family: Leo, Leona and Albert. Photograph courtesy of Charis Hearn (great-granddaughter of Tillie and Peter Zambotti). 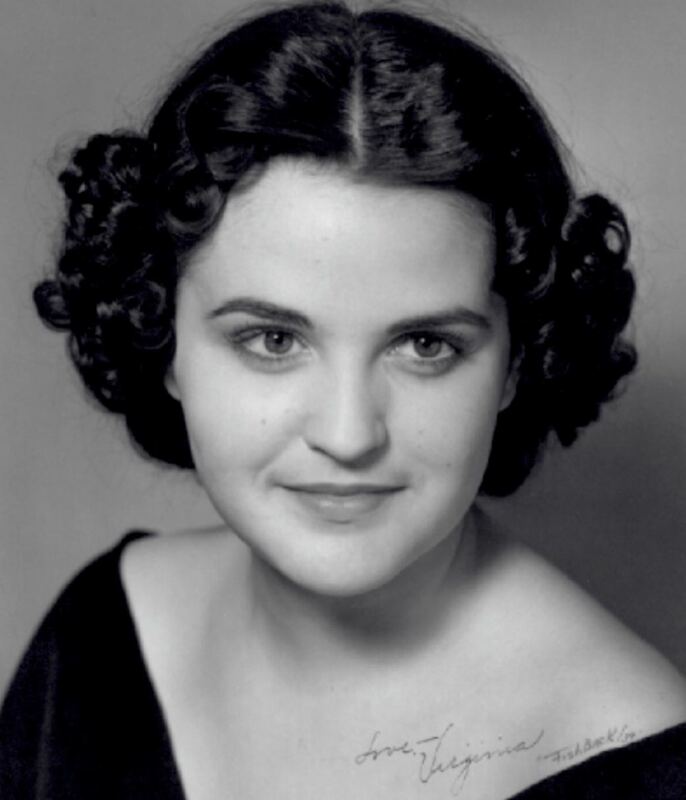 Elizabeth “Betty” Zambotti (Reich) (1912-1995), daughter of Tillie and Peter Zambotti – high school graduation portrait. 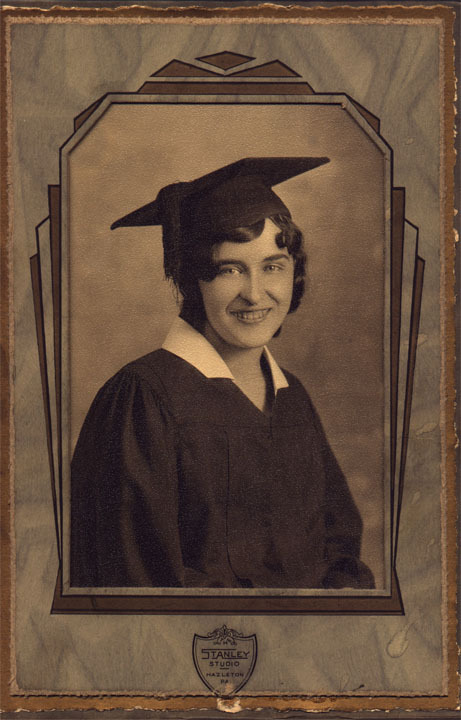 She graduated in 1930 from the Public High School of Black Creek Township in Pennsylvania. Photograph courtesy of Charis Hearn (granddaughter of Betty Zambotti Reich). 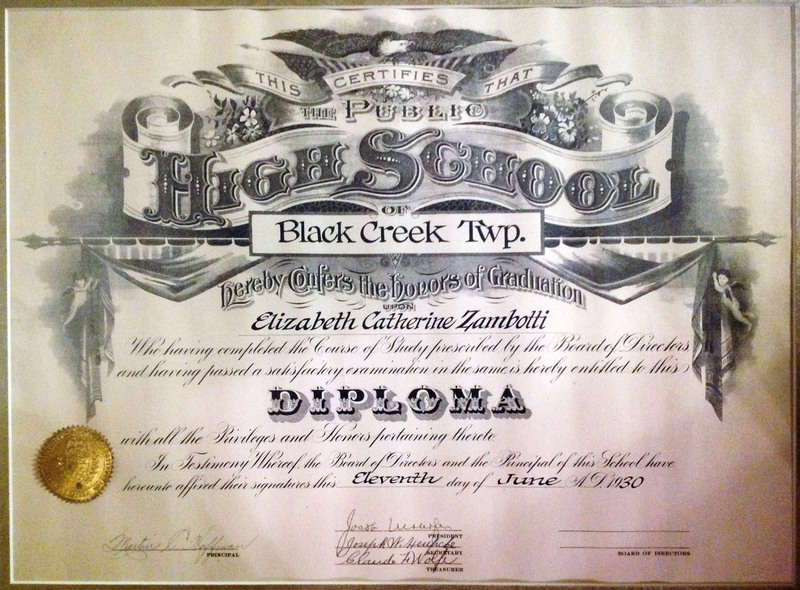 High school diploma of Elizabeth Catherine Zambotti, daughter of Tillie Genetti and Peter Zamobtti. From Black Creek Township High School, dated June 11, 1930. Photograph courtesy of Lewis Reich (son of Betty Zambotti and Lewis Reich). 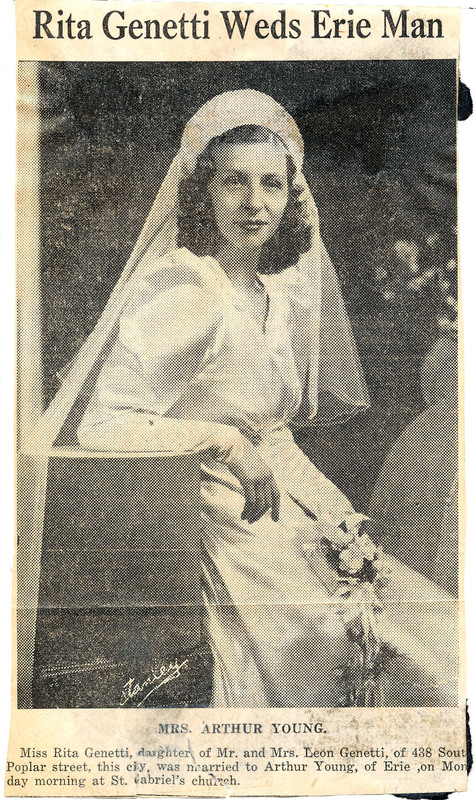 Wedding portrait of Betty Zambotti Reich (granddaughter of Damiano and Oliva Genetti), photographed on June 3, 1935. 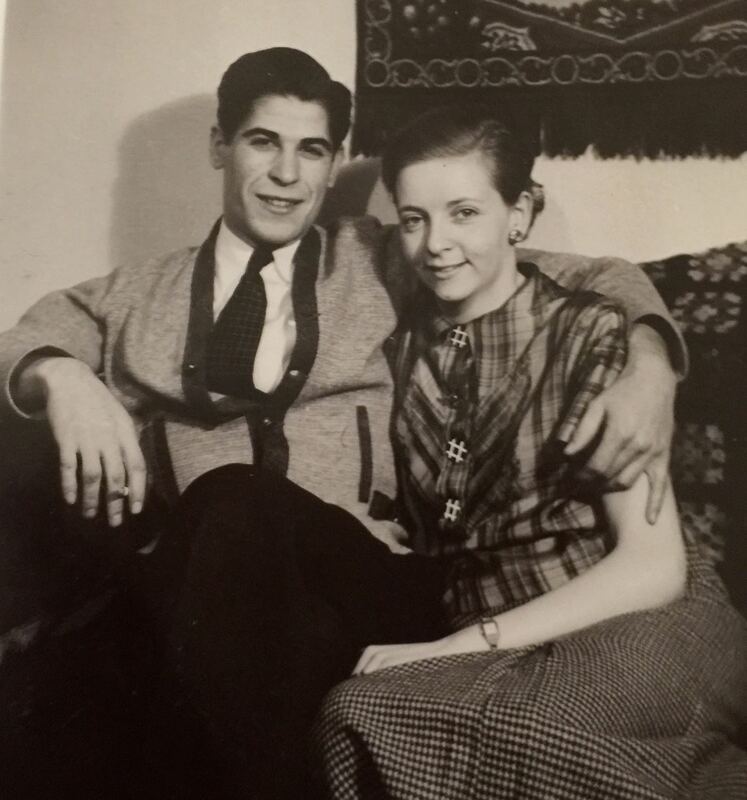 Betty and Lewis Reich were married in Weston, Pennsylvania. To see their wedding video, go to the Video Page under Gallery. 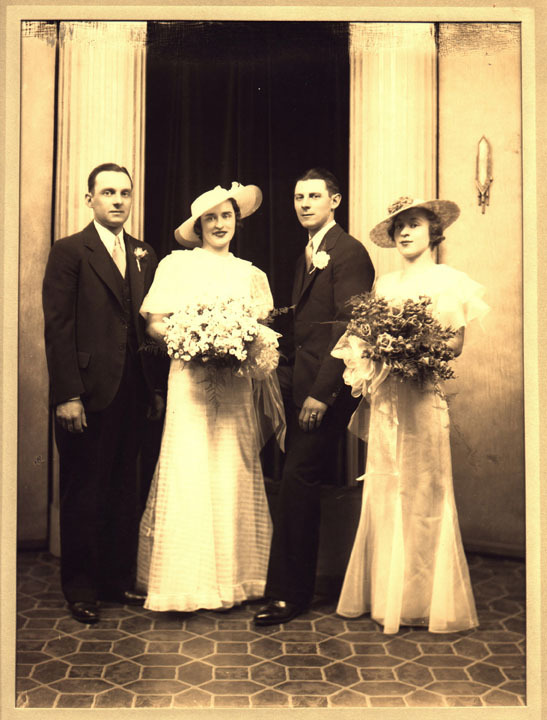 Formal wedding portrait of Betty Zambotti and Lewis J. Reich, June 3, 1935, photographed by a professional studio in Hazleton, PA.
Lewis J. Reich with his bride, Betty Zambotti, and their attendants on their wedding day, June 3, 1935. To see their wedding video, go to the Video Page under Gallery. 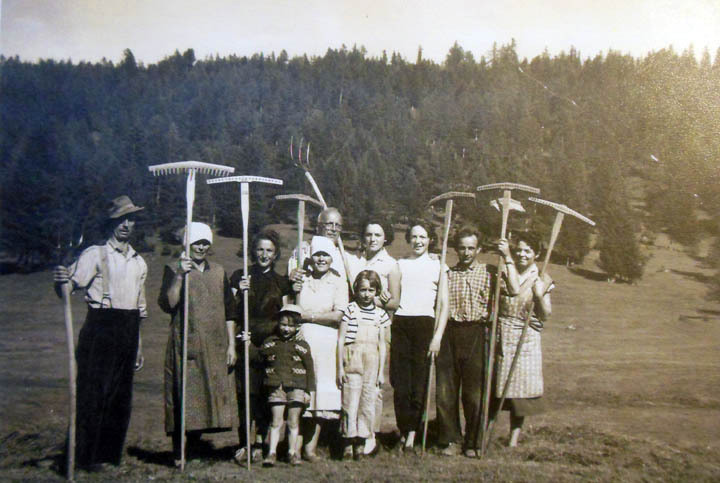 Group photo of Zambotti – Reich family, probably photographed late 1930’s or early 1940’s. 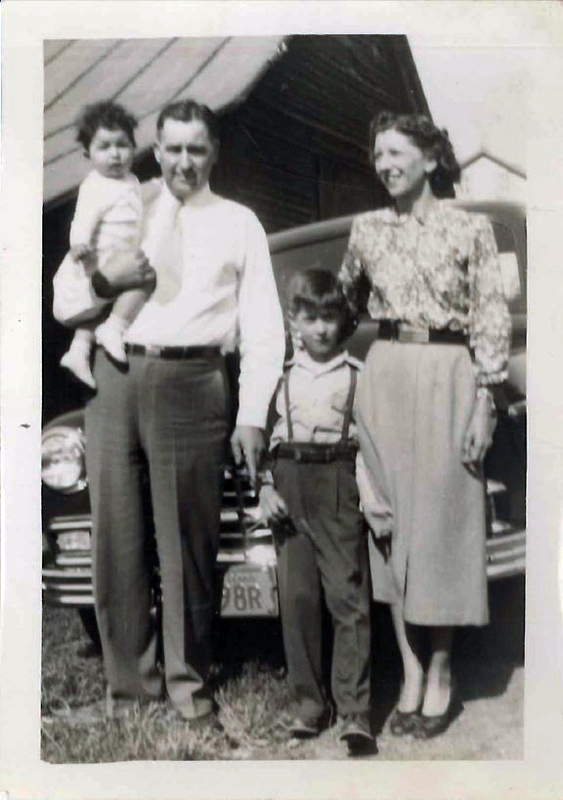 Left to right – Kneeling: George Reich (1904-1974) brother of Lewis J. Reich, Betty (? ), Ida Reich (1908-1993) wife of Carl Reich and sister-in-law to Lewis and Betty Reich, Betty Zambotti Reich (1912-1995) daughter of Tillie Genetti Zambotti, Leona Zambotti (1916-1987) daughter of Tillie Genetti Zambotti, Tillie Genetti Zambotti (1890-1985). 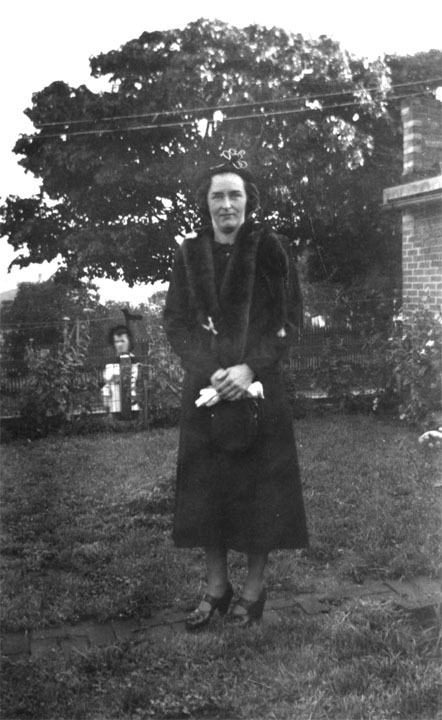 Betty Zambotti Reich (1912-1995) in fur coat with fur shawl collar, probably photographed late 1940’s or early 1950’s in the back yard of Betty’s grandmother, Oliva Genetti. The house is still in existence on S. Fulton Court in Hazleton, PA.
Betty’s fur came from Gus Genetti’s Mink Ranch located in Sugarloaf, PA. Her brother Leo Zambotti was employed at the mink ranch for many years. 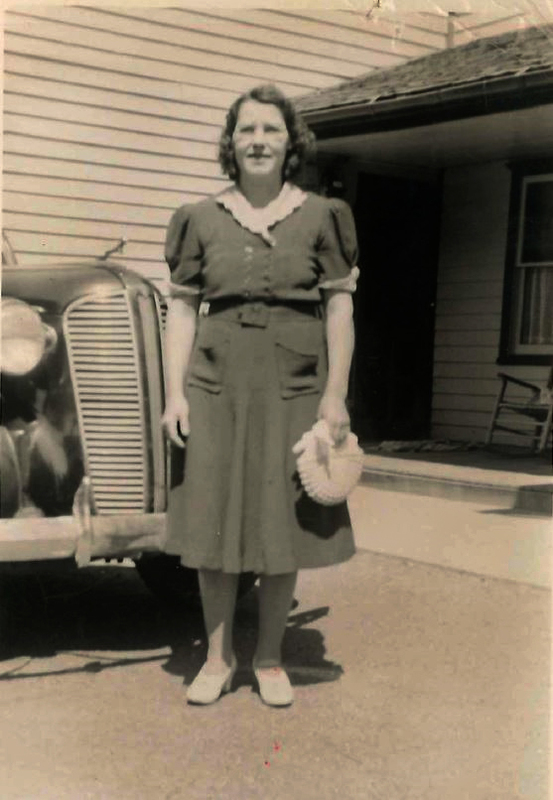 According to Betty’s obituary, she also worked for the Genetti family in the bakery department of the Genetti Markets. Family photo at the wedding of Erma Ripple to Leo Alex Zambotti (1913-1993) – son of Peter and Tillie Zambotti, photographed April 27, 1957. 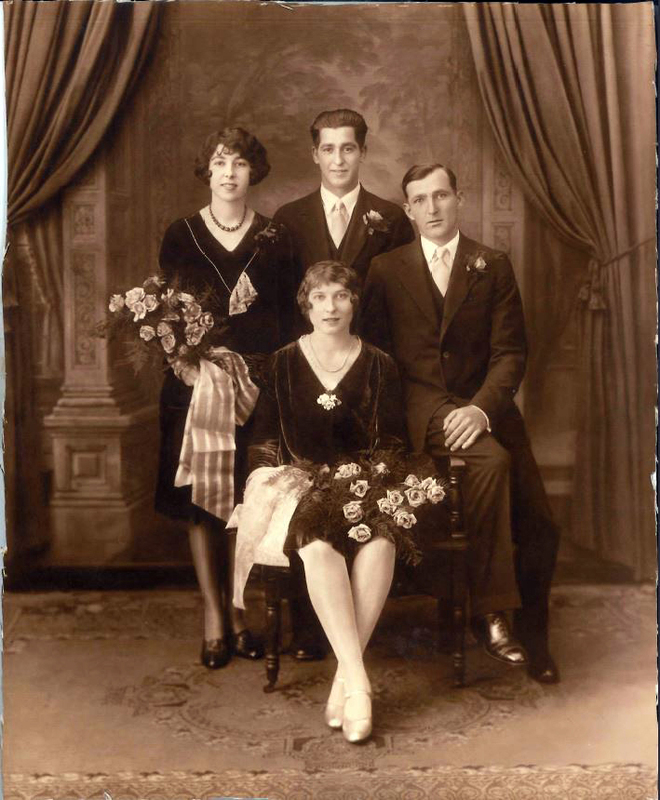 Left to right – Peter Zambotti (1881-1966), Tillie Genetti Zambotti (1890-1985), Erma Ripple (1925-living), Aunt Barbara? 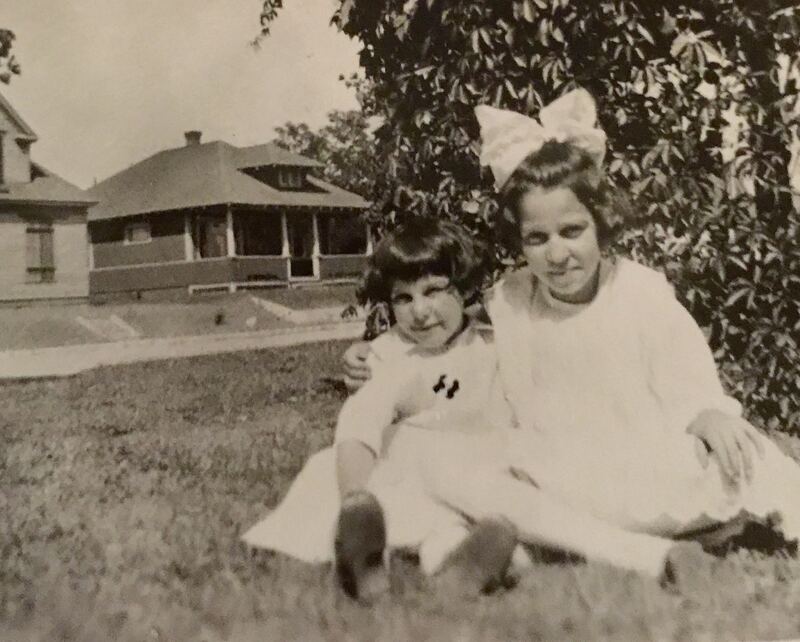 (possibly Catterina Barbara Zambotti, Peter’s sister), and Leona Zambotti (1916-1987) – daughter of Peter and Tillie Zambotti. 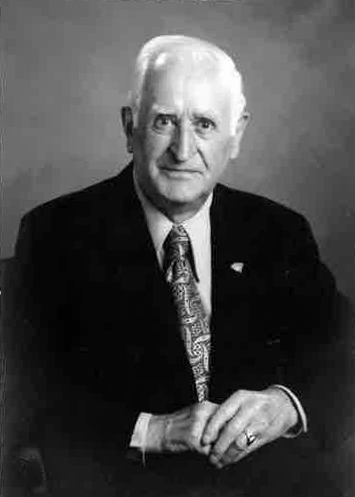 According to the obituary of Leo A. Zambotti, he operated the Genetti Mink Ranch for many years until its closing in the later 1960’s. Photograph courtesy of Charis Hearn (great-granddaughter of Peter and Tillie Zambotti). 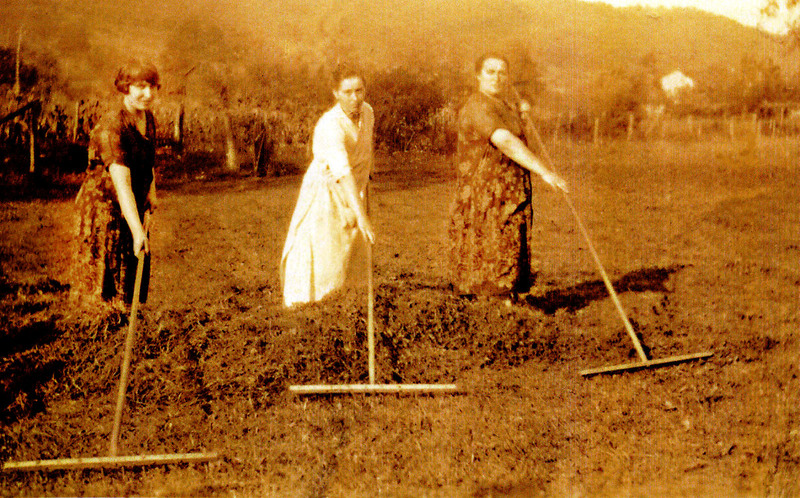 Three sisters, Erma Genetti Branz (1896-1971), Tillie Genetti Zambotti (1890-1971) and Dora Genetti Bott (1889-1971), working on Tillie’s farm in Black Creek, Pennsylvania (near Hazleton). The photograph was probably taken in the 1920’s. 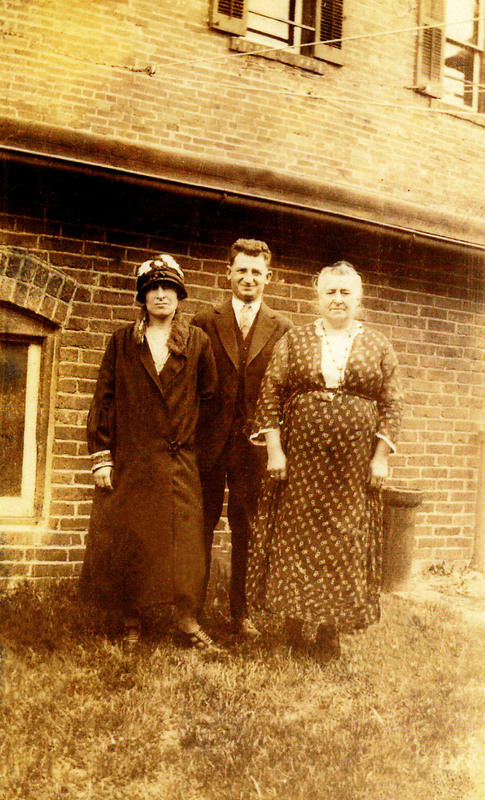 Erma Genetti Branz (1896-1971), her husband Henry Branz (1898-1971), and Erma’s mother Oliva Zambotti Genetti (1861-1938). They are probably standing outside of one of their homes in Hazleton, Pennsylvania. Judging from the style of clothing, the photograph was probably taken in the 1920’s. 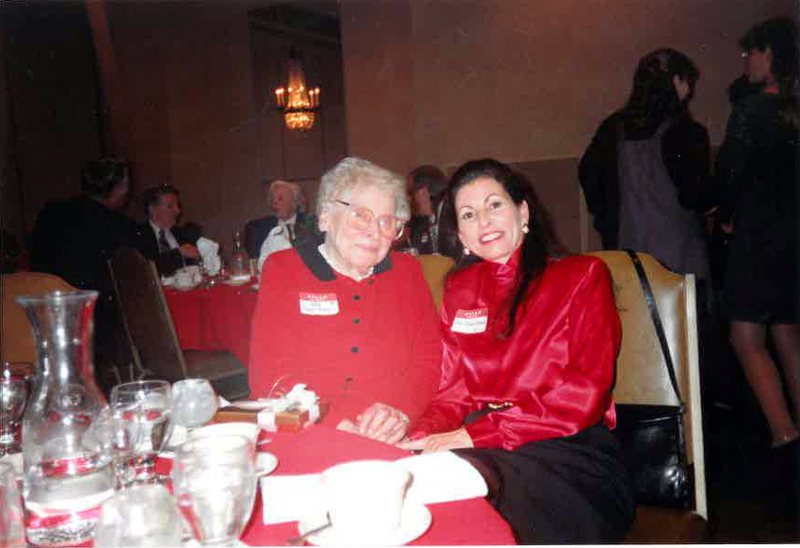 Catherine Branz LaPorte (1923-2015) and her sister Regina “Jean” Branz Daly (1931-2017). The sisters are the daughters of Erma Genetti and Henry Branz, and the granddaughters of Damiano and Oliva Genetti. Photographed in the mid-1930’s. The wedding of Catherine Branz Laporte (1923-2015), May 4, 1946 with her sister Jean Branz Daly (1931-2017) as her bridesmaid. Photograph is courtesy of Barbara Joliat. 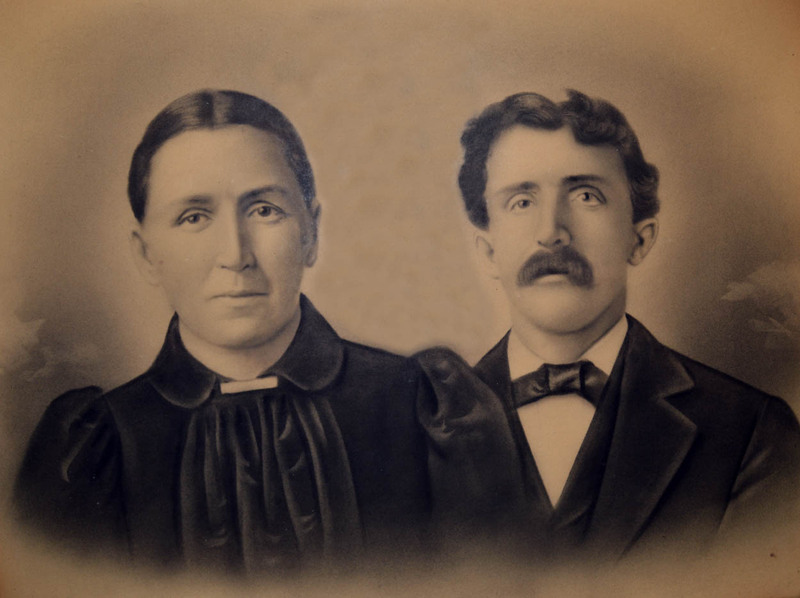 Oliva Zambotti Genetti (1861-1938) and Lucia Zambotti Genetti (1865-1952). Oliva and Lucia were sisters and sisters-in-law, since they married brothers (Damiano and Rafaele Genetti). Born in Castelfondo, Tyrol, they were the daughters of Alessandro Zambotti and Maria Covi. 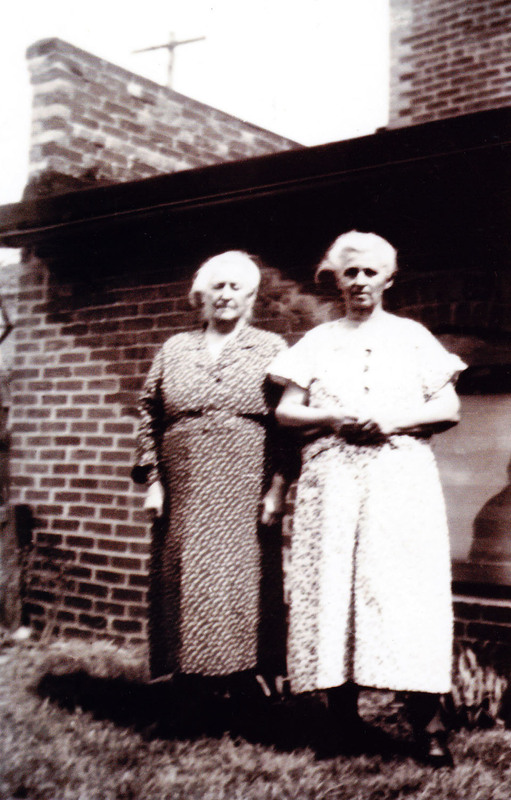 After they emigrated to the United States (Lucia in the early 1890’s and Oliva in 1906) the sisters lived near each other in Pennsylvania. 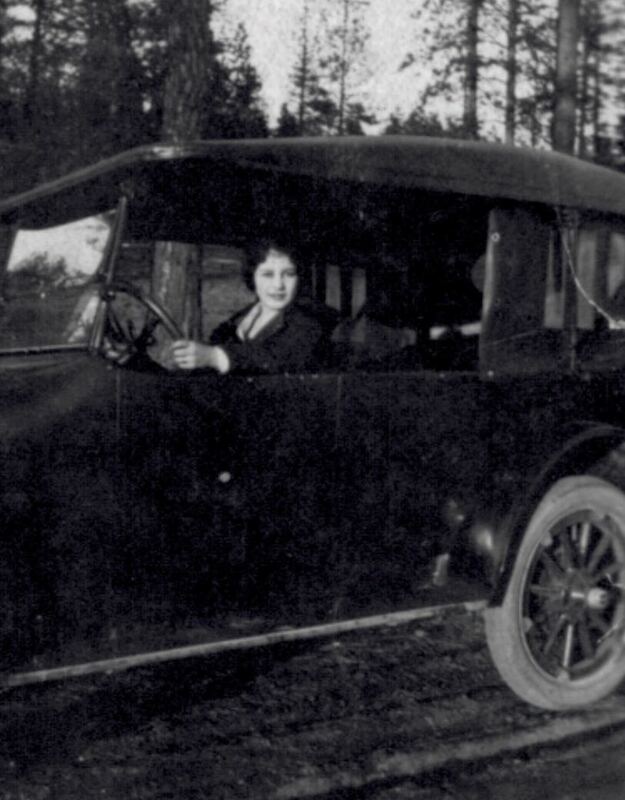 This photograph was probably taken in the 1930’s, close to the end of Oliva’s life. Damiano and Oliva Genetti had five surviving daughters. Back row: Esther Genetti (1895-1985), Tillie Genetti Zambotti (1890-1985). 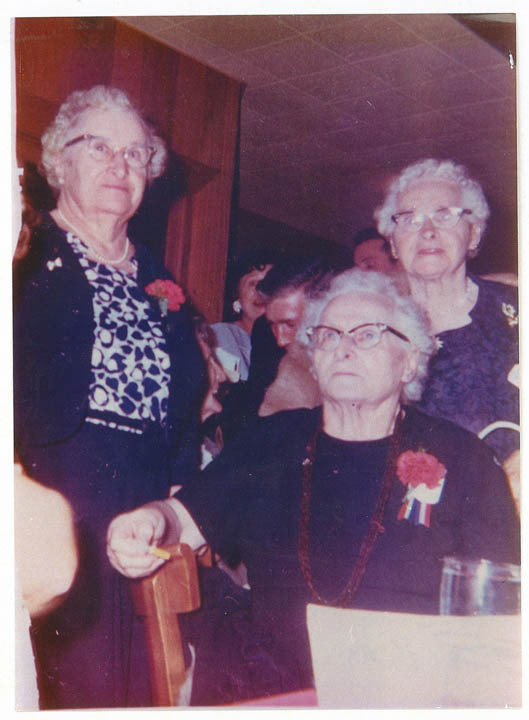 Front row: Dora Genetti Bott (1889-1971), Erma Genetti Branz (1896-1971) and Ann Genetti McNelis (1903-2005). This photograph was probably taken at their brother’s business, Gus Genetti’s Hotel and Restaurant in Hazleton, Pennsylvania. Judging from the style of clothes and the fact that Dora has a corsage on, this may have been photographed in 1969 to celebrate Dora’s 80th birthday. Scroll to the top of this page to view a black and white portrait of the sisters photographed sixty years earlier in 1909. Photograph is courtesy of Jean Branz Daly. 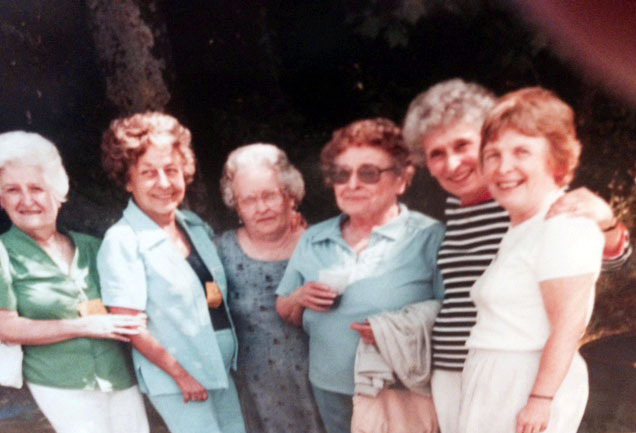 L to R: Catherine Branz, Esther Bott, Betty Zambotti, Ann Genetti, Agnes Bott and Jean Branz. A gathering of first cousins and one aunt! 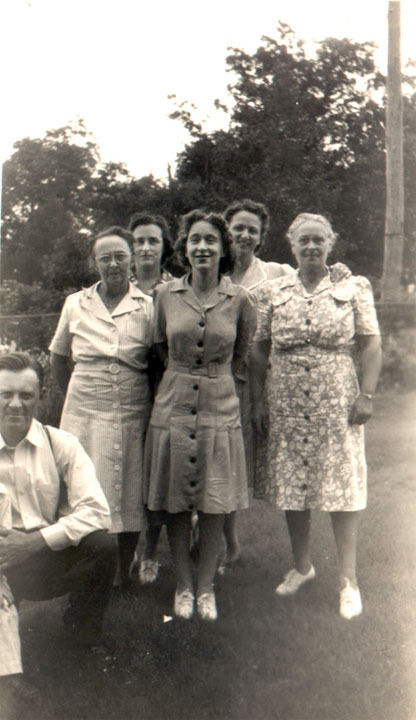 Left to right: Catherine Branz LaPorte (1923-2015), Esther Bott Clark (1915-2011), Betty Zambotti Reich (1912-1995), Ann Genetti McNelis (1903-2005), Agnes Bott Yorke (1917-1994) and Jean Branz Daly (2031-2017). All of the ladies were first cousins and the granddaughters of Damiano and Oliva Genetti. Ann Genetti McNelis was the youngest child of Damiano and Oliva, and the aunt to the rest of this happy gang! The photo was probably taken sometime in the 1980’s. Photograph is courtesy of Jean Branz Daly. Albino (Albert) V. Genetti (1893-1992). Albert was one of four sons born to Damiano and Oliva Genetti. He was born in Castelfondo, Austria (now Italy) and immigrated to the United States in 1904. Albert married Mildred Bonomo (1906-1989) in 1932. 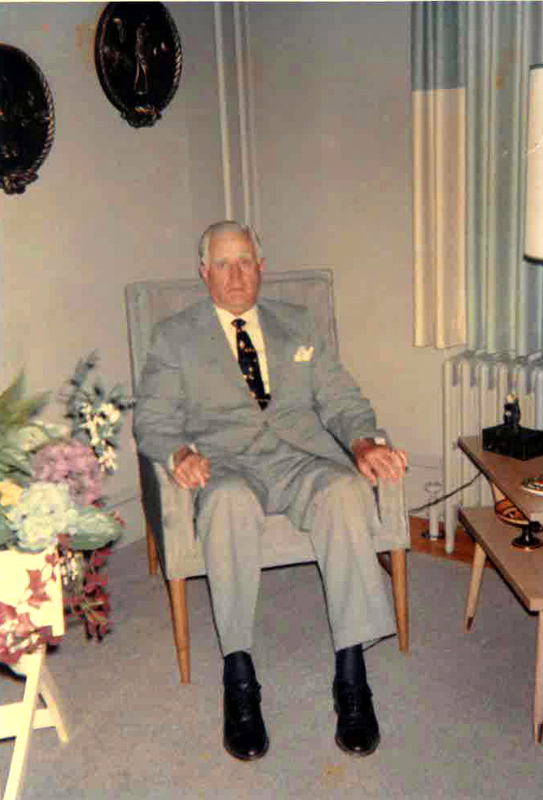 They made their home in Hazleton, PA. Albert was an integral partner in the family business, the Genetti Markets. Photograph is courtesy of Dale Genetti, granddaughter of Albert and Mildred Genetti. Albino (Albert) V. Genetti (1893-1992). Photograph taken sometime between 1950 and 1960. Albert lived to be 99 years old. Robert Albert Genetti (1933-1983), one of two sons of Albert and Mildred Genetti. Photographed in 1935. Robert married Gerald Yurick (1933-1983) in 1954. Photograph is courtesy of Dale Genetti, daughter of Robert and Geraldine Genetti. 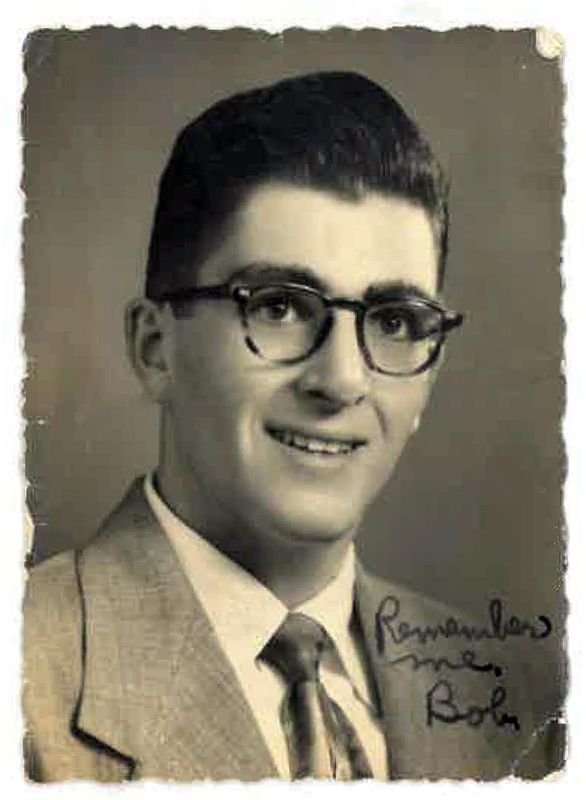 High school portrait of Robert A. Genetti (1933-1983), photographed around 1951. Wedding announcement of Rita Genetti (1915-1998) to Arthur Young (1913-1947), published in the Hazleton paper on October 28, 1940. Rita was the daughter of Leon Genetti and Angeline Marchetti, and the granddaughter of Damiano and Oliva Genetti. The announcement reads: Miss Rita Genetti, daughter of Mr. and Mrs. Leon Genetti, of 438 South Poplar street, this city, was married to Arthur Young, of Erie, on Monday morning at St. Gabriel’s church. Cousins Margaret Young, Sandra Farkus and Arthur Young walking with Sandy’s father, Stephen Farkus (1915-1997). 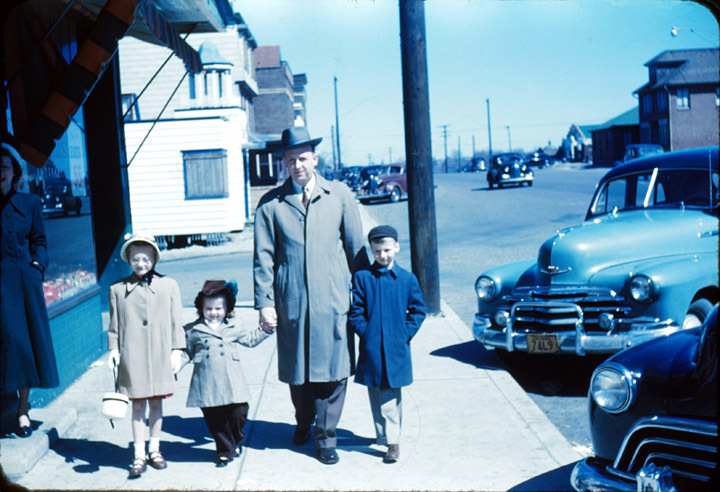 Easter morning, about 1949, Hazleton Heights, Pennsylvania. Photograph courtesy of Louise Genetti Roach, photographed by her father Joseph E. Genetti. Rita Genetti Young (1915-1998), Leon Genetti Jr. (1928-2017), Catherine Genetti Farkus (1917-2001) – siblings. Photographed at the 50th Wedding Anniversary of Catherine and Stephen Farkus, 1992 – Reading, Pennsylvania. Photograph courtesy of Sandra Farkus Eshelman, daughter of Catherine Genetti Farkus. 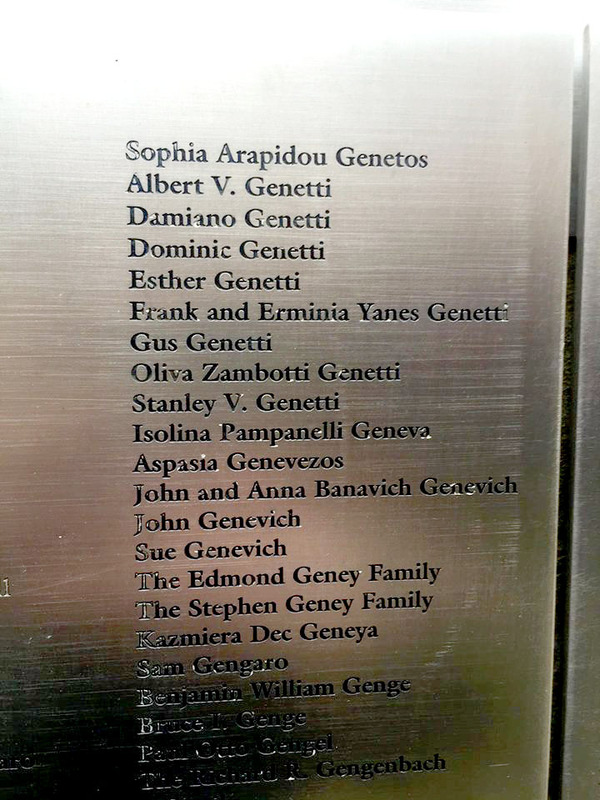 The Genetti ancestors represented on the American Immigrant Wall of Honor, a national monument on permanent exhibition at Ellis Island in New York City. Photograph courtesy of William Genetti (who’s grandfather is Gus Genetti) and Morgan MacDonald. Thank you for commenting. Looking at this page I just realized that it shows a photographic chronological history of my family in America. So interesting as I always viewed each image as an individual moment and not as part of the whole story. Memories! We used to frequent Gus and Stan’s restaurants, and my high school prom was held in the grand ballrom at Gus Genetti’s. Every Friday night was grocery shopping at Genetti’s supermarket when I was growing up in Freeland. 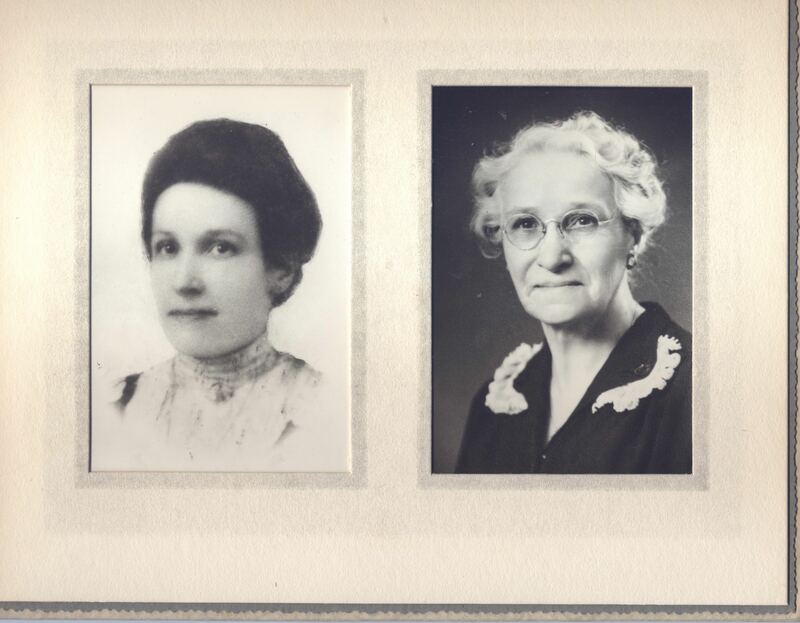 Great to see pics of Erma Branz and Catherine Branz LaPorte, they were very good friends of our family. I have been to Hazleton Pa. many times, and still have relatives there. I belong to the Marchetti clan, and have the names of Genetti, Bott, zambotti, and many others in my family tree. My Great, Great grandfather was Leon Marchetti, and his son was Joseph, and his son was Andrew and his daughter was my mom Adeline Marchetti (Hine). My sister and I are planning a trip to Castelfondo next year. Her son is moving to Italy in a few months with the air force. and we are going over to search out our roots. thank you so much for the journey down memory lane. The pictures are wonderful. Our grandfather, Martin Santini, were close friends of Leon and Angeline Genetti. My brother Richard and I remember from the late 50’s and 60’s being with our grandparents in Hazleton, at their home for a polenta party, visiting the Genetti market, going to a coal mining area where there was a smoldering underground fire from a collapsed mine and even a trip o the Saint Lawrence with them and our grandparents. We have some photos somewhere. My grandmother was from the Fellin family, also from Hazleton. Several of the Fellin sisters married some of the Santini brothers. There was a Fellin family reunion held in the 70’s at your motel and catered by your family. Any one have some knowledge of those old days? We remeber how close friends our grandparents were with Leon and his wife Angelina. Your polenta was different from what my grandparents made – you used chestnut flour as part of you mixture. I talk too much. We would love to hear from your family. Thank you for writing such a wonderful comment! I am the granddaughter of Leon and Angeline Genetti and also have fond memories of my Nona and Nono. Unfortunately I was just a young child when they passed away in the early 60’s. But my parents started their marriage living in the apartment above my grandparents’ home and I often spent afternoons with them until the age of five. I remember my Nona showing me how she made polenta pie in a big, black cast iron skillet and my Nono making Tyrolean sausage in the basement then hanging it on hooks in his walk-in refrigerator. We are most likely related since Angeline’s mother (my great-grandmother) was also a Fellin. I would guess that your grandmother and my grandmother were probably first or second cousins. The Genetti Hotel in Hazleton was first owned by Gus Genetti Sr., brother to Leon. His son Bill Genetti then took it over in the 70’s. Bill and I are first cousins, once removed since he is from my father’s generation. The hotel was recently sold and Bill has now retired. There are not many of the older family left – only one of Leon and Angeline’s children is still alive, my Uncle Leon who still lives in Hazleton. My grandfather had eight siblings, the last passed away in 2005 at the age of 102 (Angela Maria Genetti McNelis). There are only about ten surviving children from my father’s generation (their children). Please fell free to email me directly at info.genetti.family@gmail.com. It would be interesting to find out if we have a common Fellin ancestor. If you send me info on your Fellin lineage (names and birth dates) I might be able to find the link. 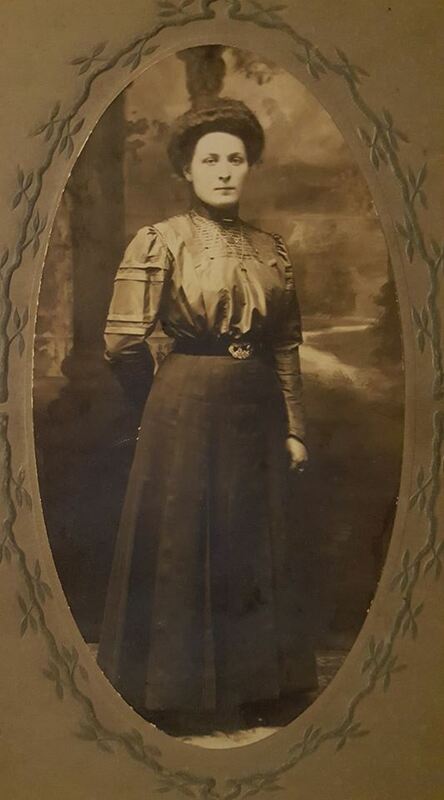 I can trace the Fellin family back four generations beginning with my great-grandmother Catterina Lucia Fellin. I look forward to hearing from you. First of all: thank you Luciana for the creation of this incredible web-sit, amazing not just for Genetti’s relatives, but for everyone loves history. Second of all: I hope everyone will forgive me for my terrible english, i’m a young italian guy not very practiced with foreign languages. I’ll do my best. I came here during a little reasearch I was try to do over a my very far relative: his name was Primo Genetti, brother of my great grandfather. He is not part of this “branch” of the Genetti family, but I hope you or someone else can have some informations on him, it will be amazing. His father was Pietro Genetti (Peter), his mother was Maria Romana Genetti (Mary). His parents were born in Castelfondo, Italy, and then moved to USA. 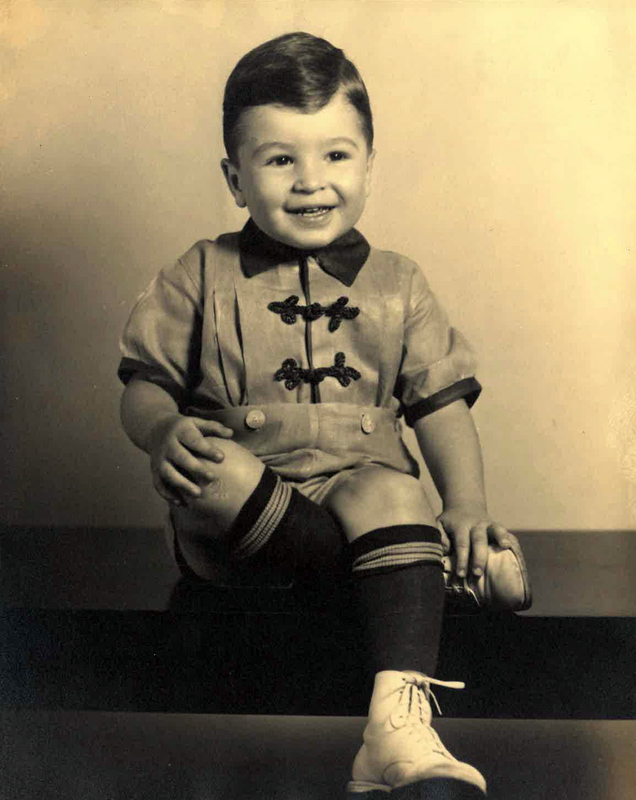 Primo was born in USA, we think in Michigan between 1915 and 1920. He had two brother, named Florio Genetti and Albert Genetti. Florio worked as barber, Albert was a kind of engineer. Primo worked as gynecologist. He fought in the secondo world war in the US Army, becoming doctor-colonel and even land on Omaha Beach on the D-Day, 6th June 1944. He was married, but unfortunalety we dont know names of her wife or her children, but we know for sure he had at least two daughters, born moreless in the 40’s. We are sure of it because Primo came two times in Castelfondo. One time at the end of the war, and another time in 1949, with one (or maybe) both his daughters who were really young (about 4, 5 or 6 years old). Back in America, we know just that he divorced by his wife and moved in Florida, where he died in 1980. I hope someone will help me to have some more and further informations on him, and maybe to reach his living relatives today. Thank you for writing us. I do know of the Genetti family who lived in Michigan, but not of their ancestors. I would be glad to do a little research and see what I can find for you. Please email me at info.genetti.family@gmail.com with your private email address. Then we can converse in private. I will do my best to find information about your ancestors and see if they fit on our Genetti family tree. Since they are from Castelfondo, I’m sure that we are related, but the connection may have been hundreds of years ago. I have sent an email with my personal address to you just now. Thank you again, really appreciated your help and availability. I know this thread is now several years old it brought back many Tyrolean memories. 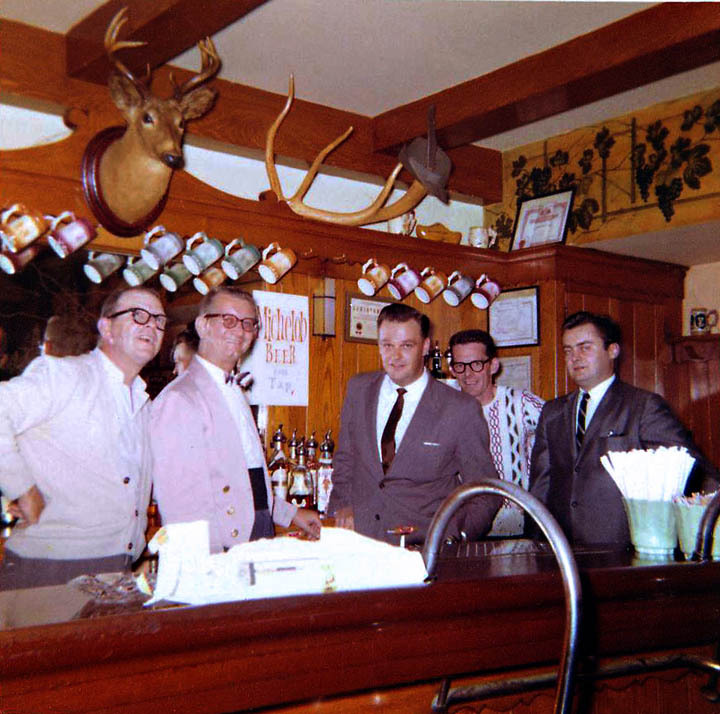 My dad Simon Facinelli ran Sims Tyrolean bar in West Hazleton from 49 until his death in 61. I have been very interested in our histories since I was about 10 . I am soon 69. I have been to Castelfondo while visiting Revo the birth place of all Facinelli. I have our history back to 1580 and 95% of ever facinelli on the planet tied in. I have never had any Genettis though I do have many Marchettis. Over the years in Hazleton we always shopped at your stores. As a boy I loved the underground bagging system at the 15th st store. Attended many events st the Tyrolean room and was a member and went to school at Our lady of Mt Carmel. I will reread your entire history a few times to get a handle of everyone. Bill was great friends with my sister Nancy possibly WHHS. Class of 53? She died 2 years ago at 78. I am the last facinelli left of the Simon f. line. It’s great that you have kept the family going. Thank you for sharing your history on line for all to share and remember. Thanks for writing Jim and sharing your stories with us. To give you some context, I am Bill Genetti’s first cousin, once removed. Bill was my father’s first cousin. My grandfather was Leon Genetti and my grandmother was Angeline Marchetti. I was just a little girl, but do remember the markets and the Tyrolrean Room (owned by my grandfather and his brothers).